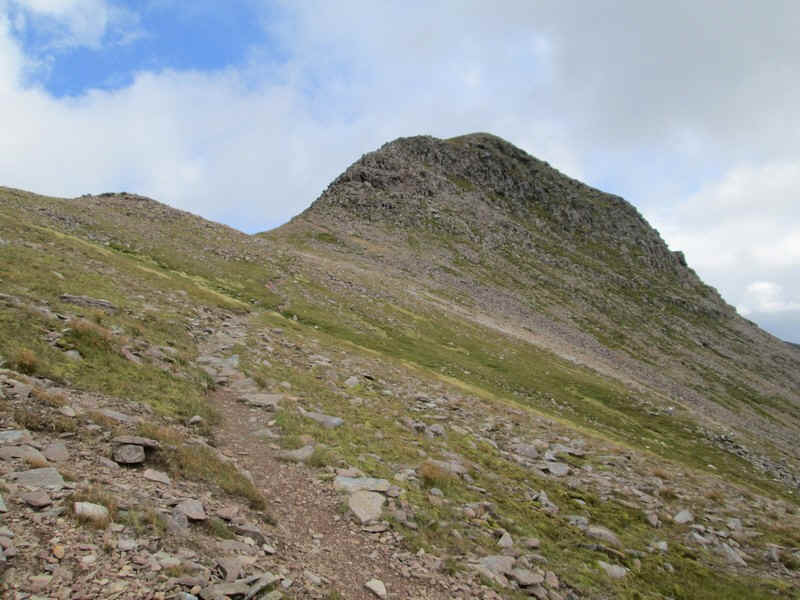 It took three attempts on these two hills before I was successful. 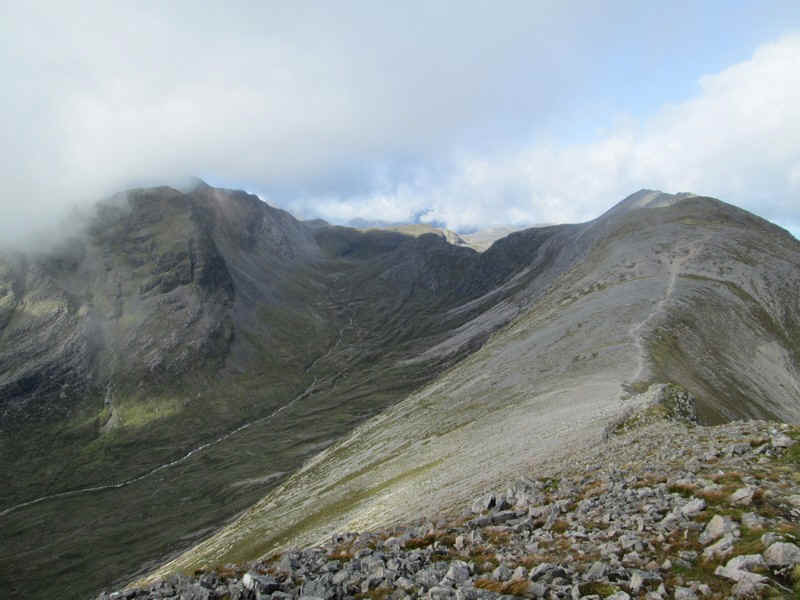 September's 2012 walk had to be abandoned because of torrential rain, low cloud and severe gales (see A bad day at Achnashellach). 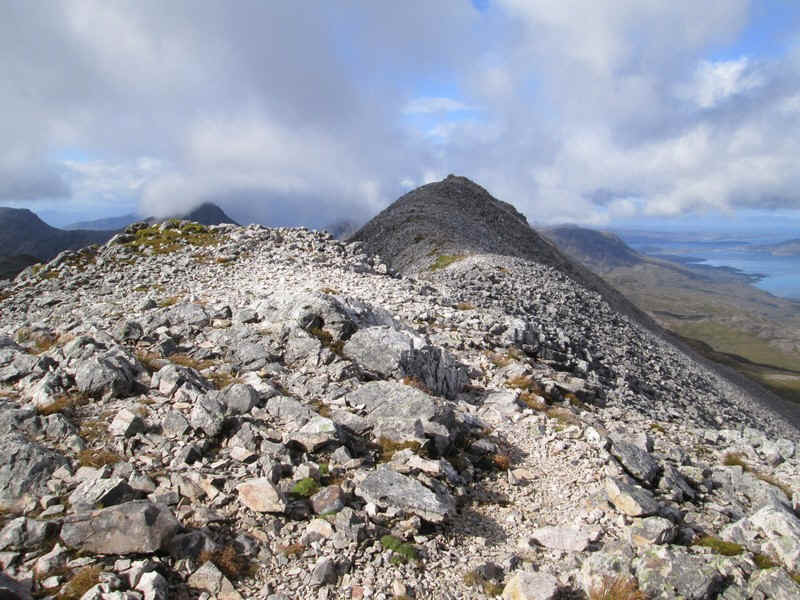 In September 2013 I set off in good conditions as far as cloud cover and lack of rain but unfortunately the forecast on MWIS was for wind speeds were 30-40mph and gusts of 60mph. 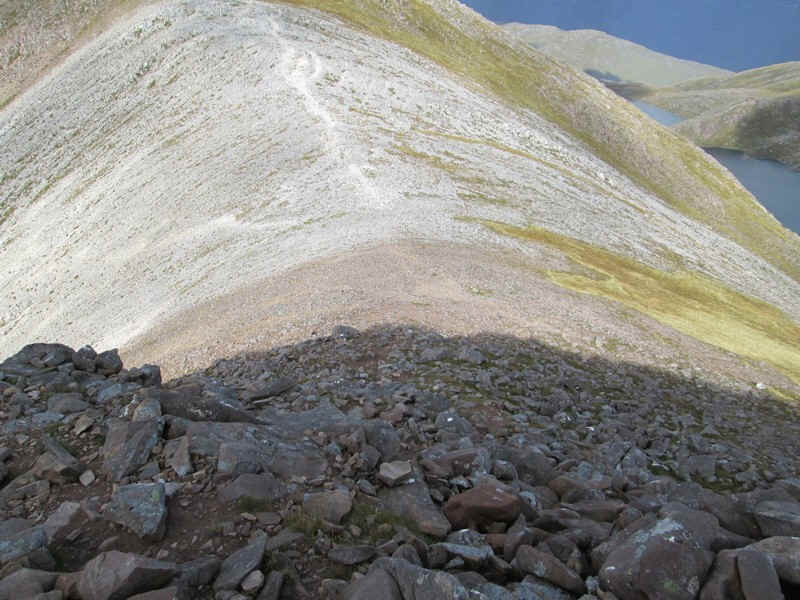 I started climbing Beinn Liath Mhor and was almost blown over even on the lower slopes. 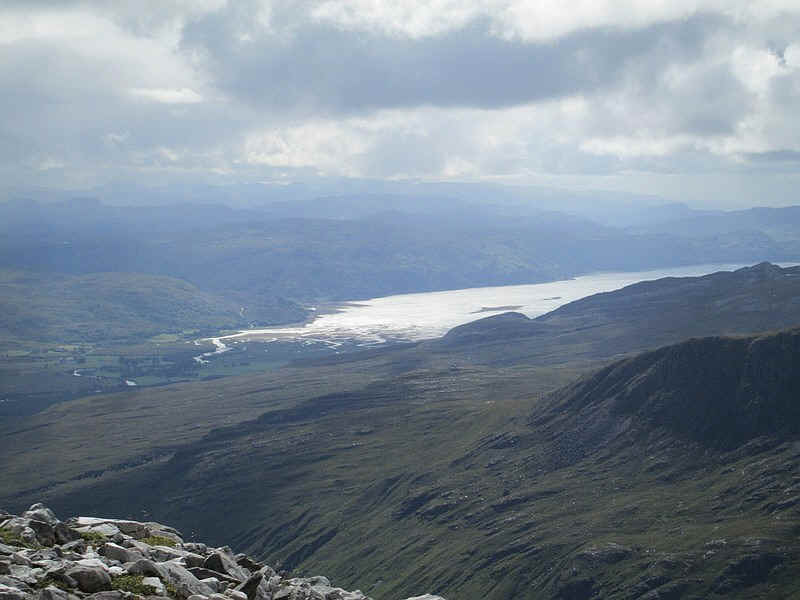 Fortunately, the next day was much more benign and i had one of my best days ever on the Scottish hills. 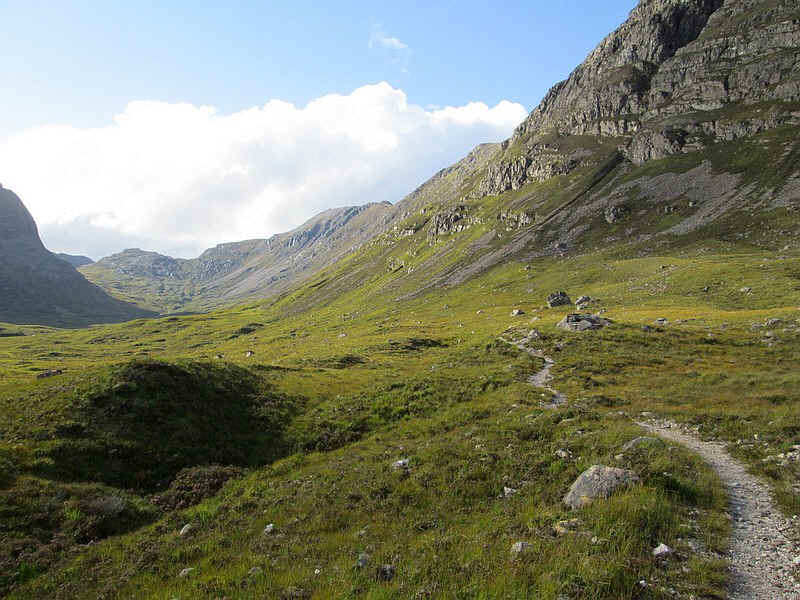 The walk started at the appallingly early time of 07:15 having caught the train from Strathcarron to Achnashellach. 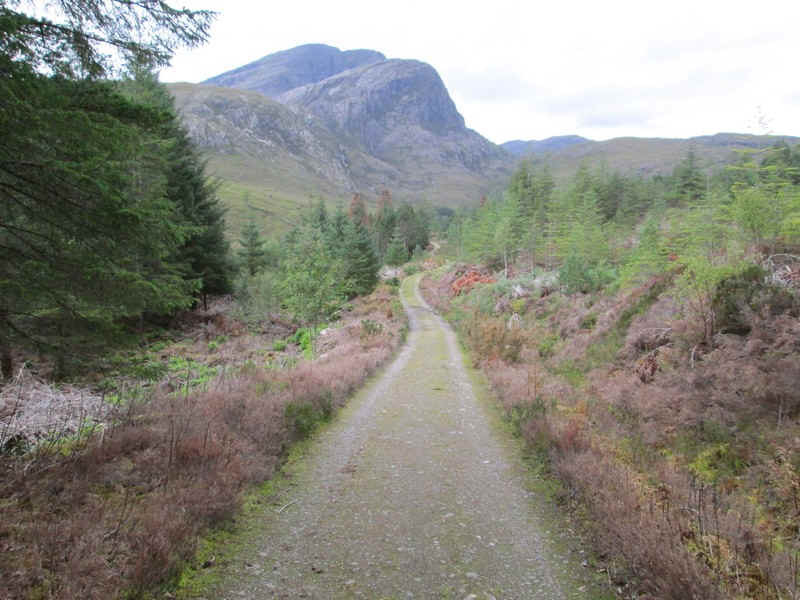 Here the route starts by crossing the railway and..
....goes a short distance into the forest before turning sharp left towards the hills. 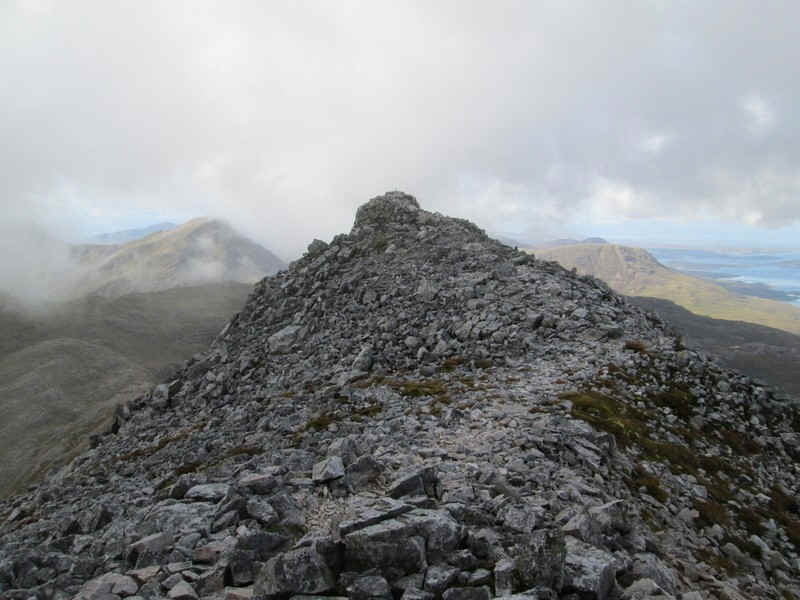 The first few photos were taken on my second attempt as visibility conditions were better than on the third attempt. 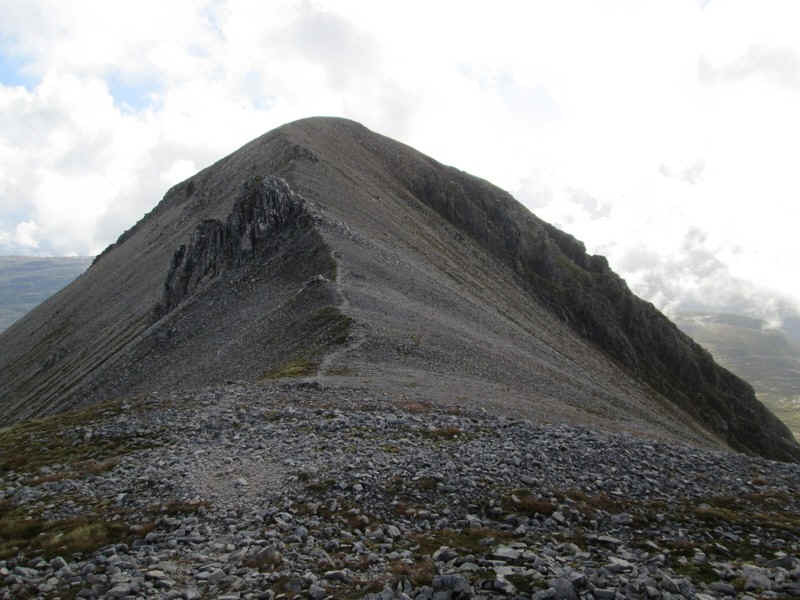 The hill here is Fuar Tholl, a Corbett 907m high. 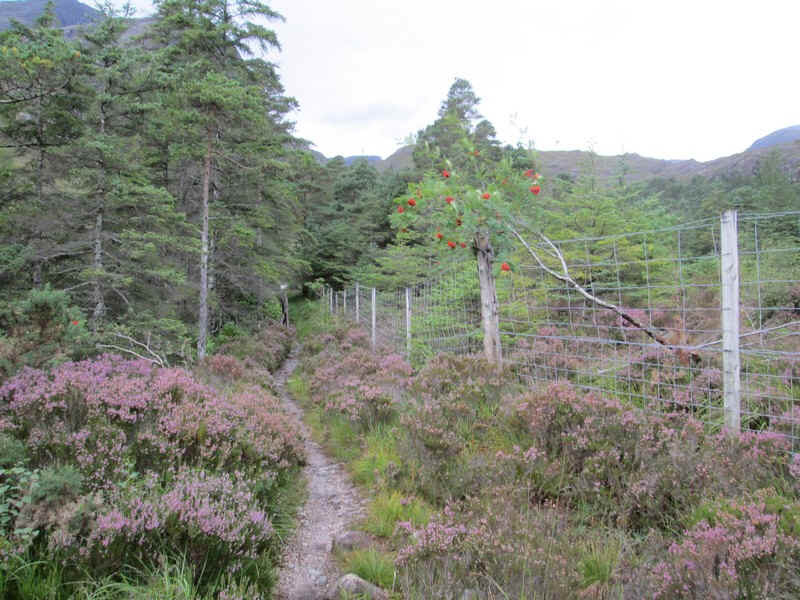 The path to the hills leaves the forest road at this marker post which has appeared since my first visit. 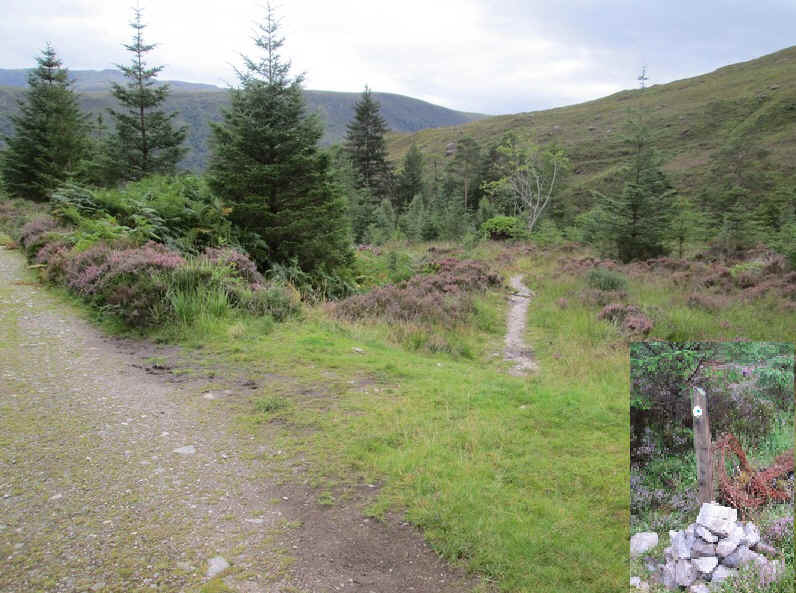 CCTV in the forests around Achnashellach - is this for real or a wind up? 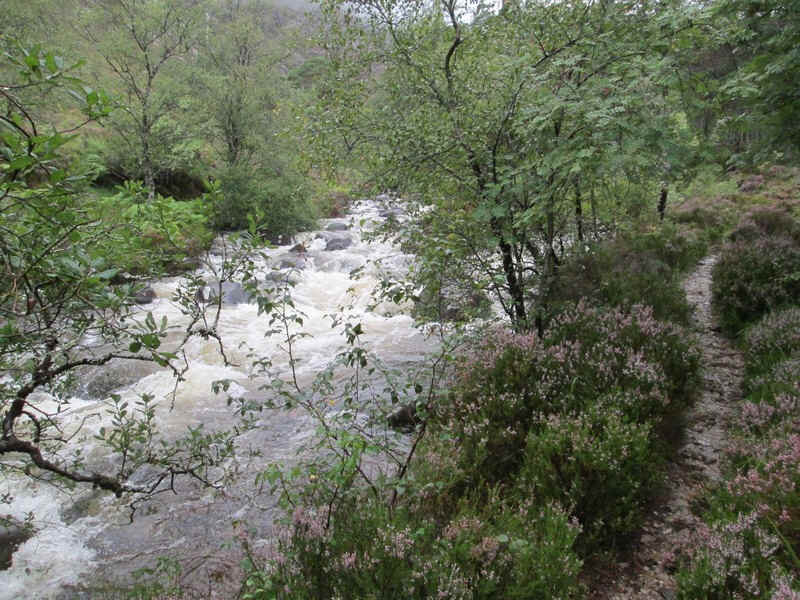 ....the Allt an Leth-chreig, here seen in full spate after heavy rainfall over the previous few days and nights. 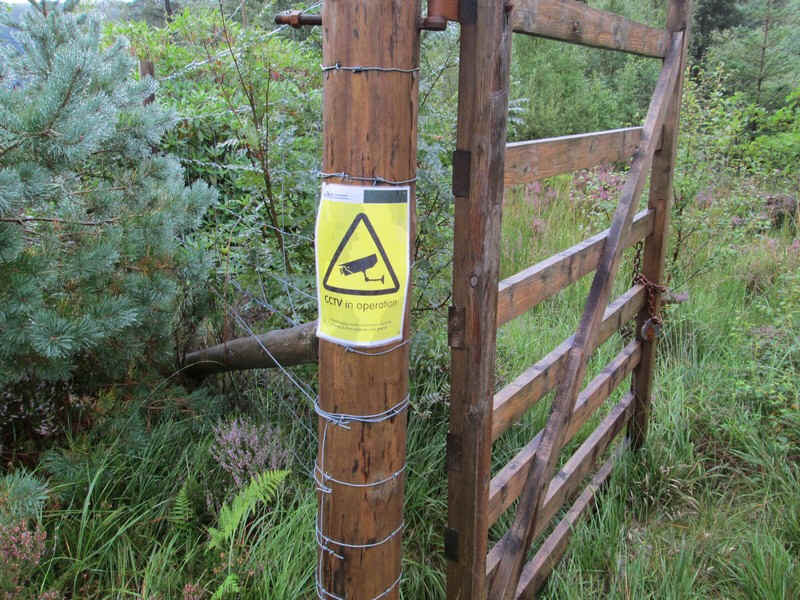 At the top of the plantation fence the first there is a notice that stalking takes place between the 15th September to 20th October. 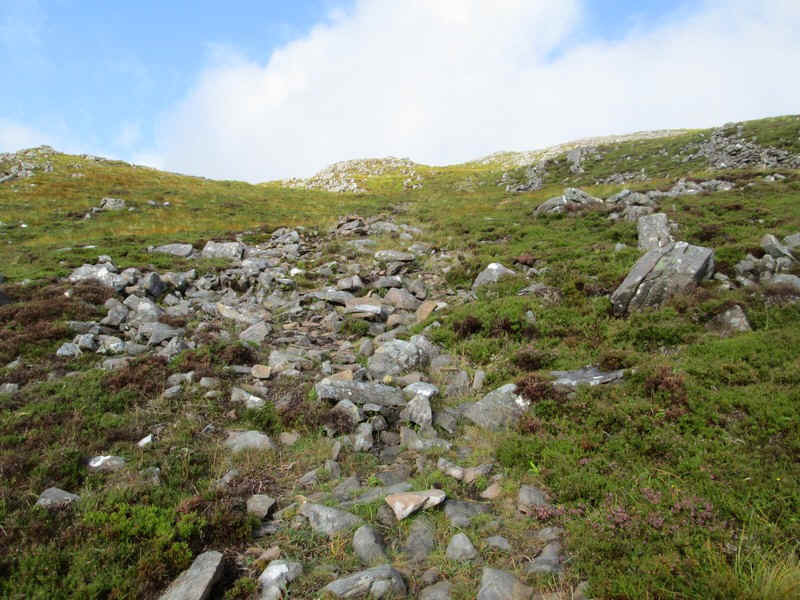 A phone call to the estate office ( 01520 7662660 had confirmed that as long as you stick to the paths there will be no problems. 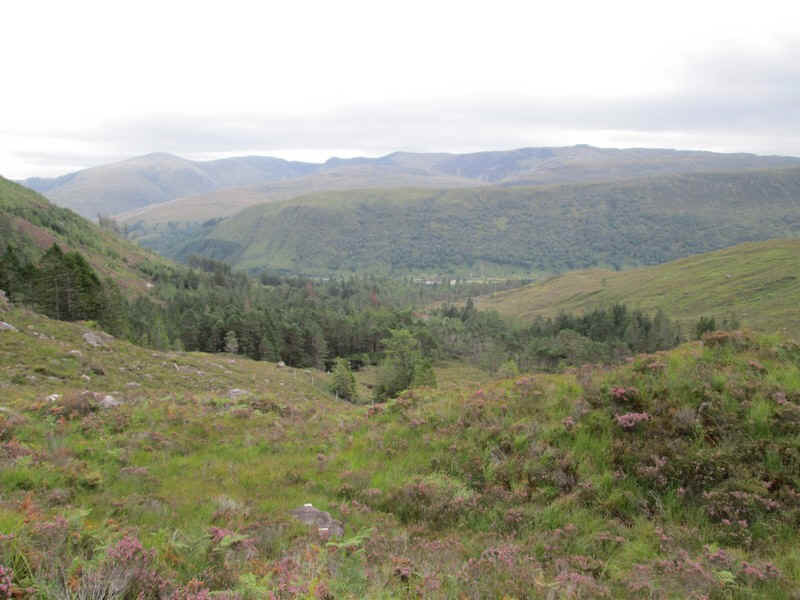 Looking back across Glen Carron. 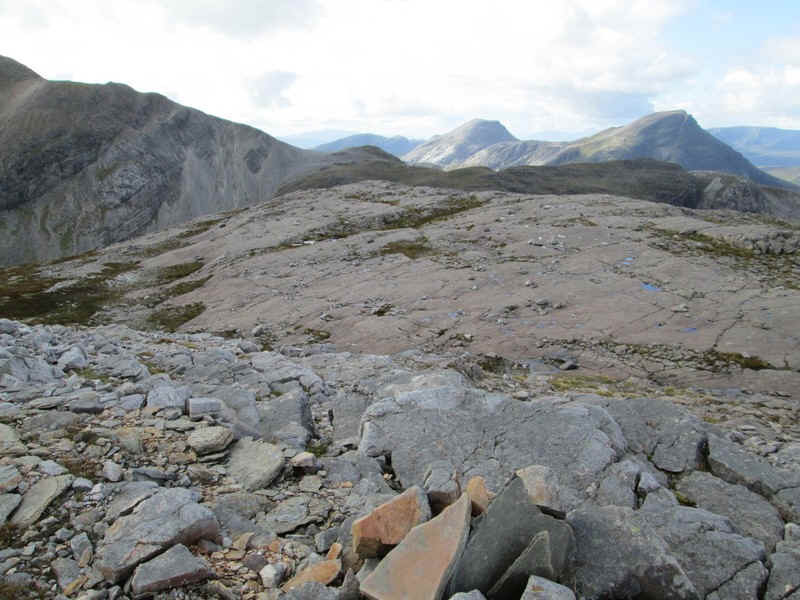 At the top of the forest the end of the Beinn Liath Mhor ridge comes into view. 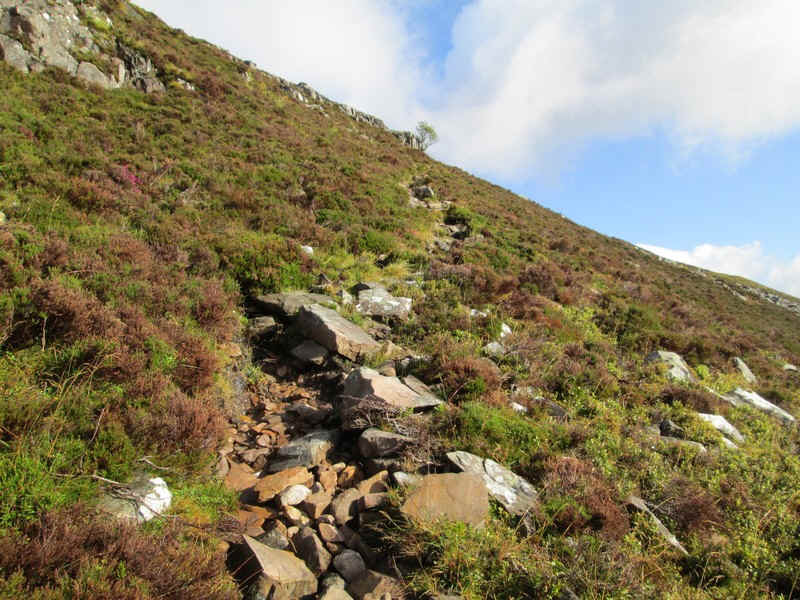 A feature of this walk is the number of sandstone slabs and pavements that will be seen. 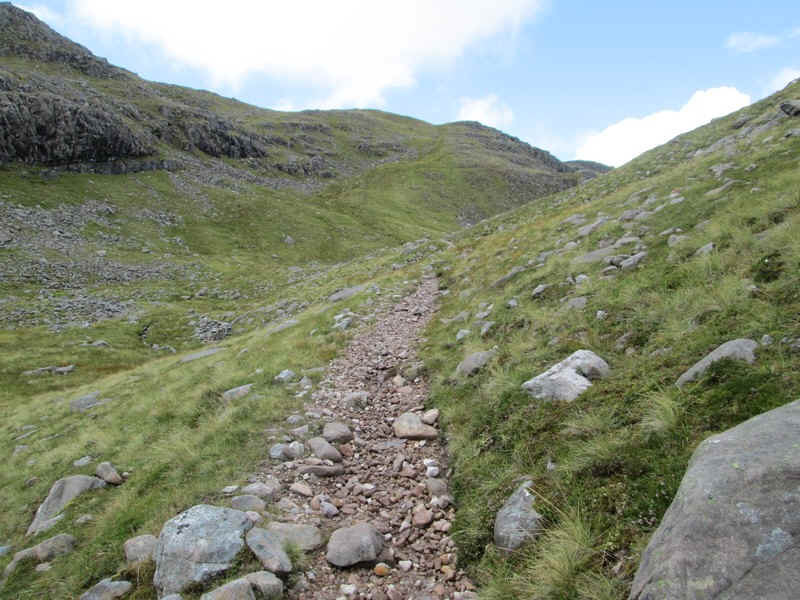 At NG 989502 the path splits. 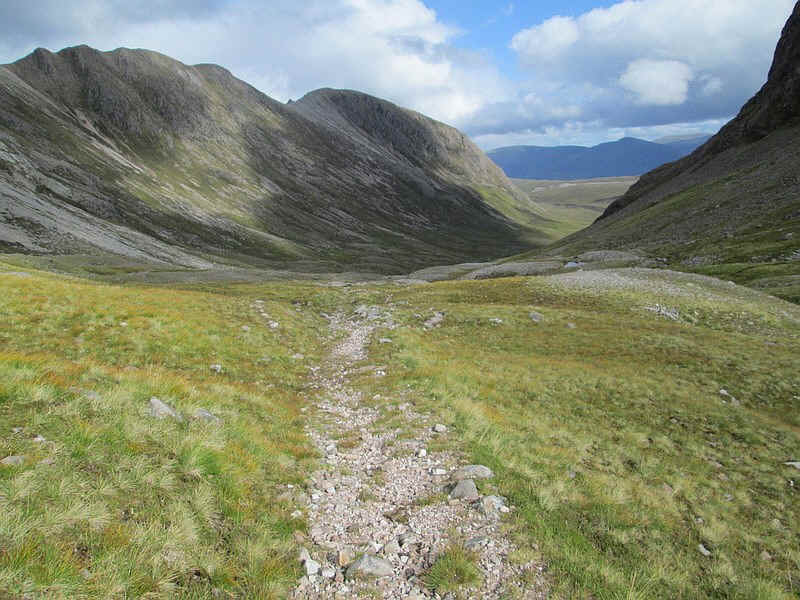 The one to the left is the normal return route from Sgorr Ruadh whilst the one to the right goes towards Beinn Liath Mhor. 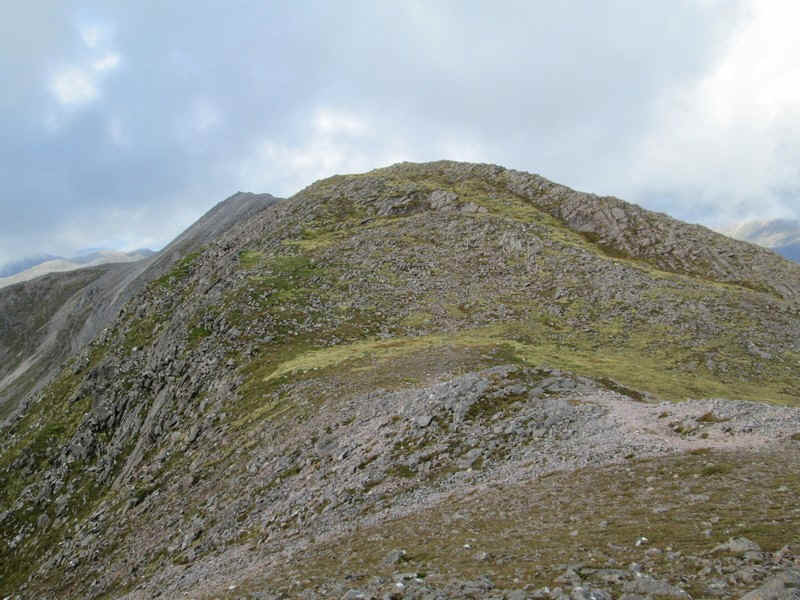 Looking up Coire Lair with Sgorr Ruadh on the left and Beinn Liath Mhor on the right . 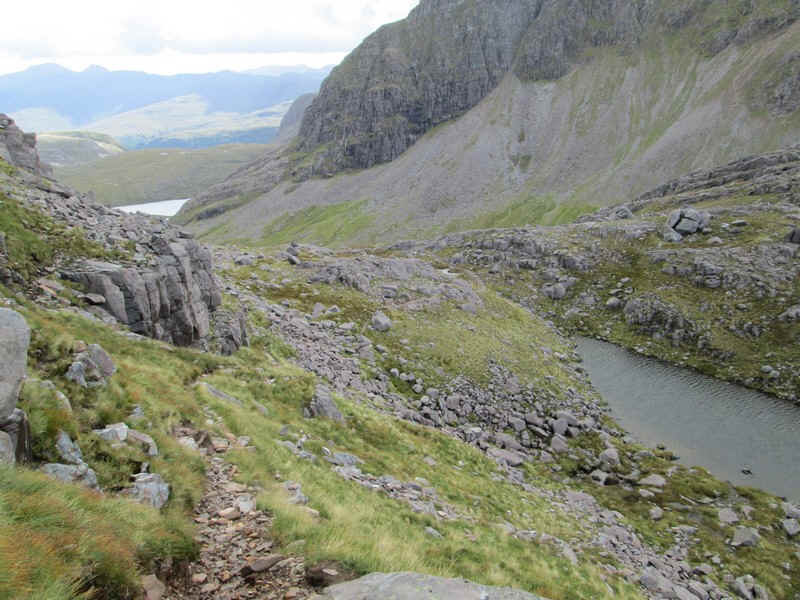 I walked down towards the river to do a quick check of the crossing, that could be used on the return route from Sgorr Ruadh, which reveals it's deep and flowing very quickly so I won't be coming back that way. 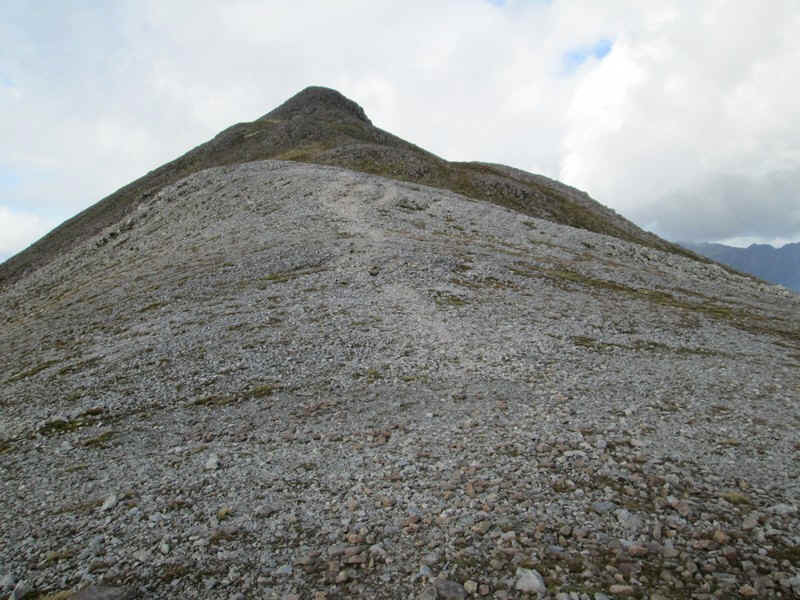 Soon after another cairn marks the point where the footpath up into Coire Lair splits from the path on the right towards Beinn Liath Mhor. 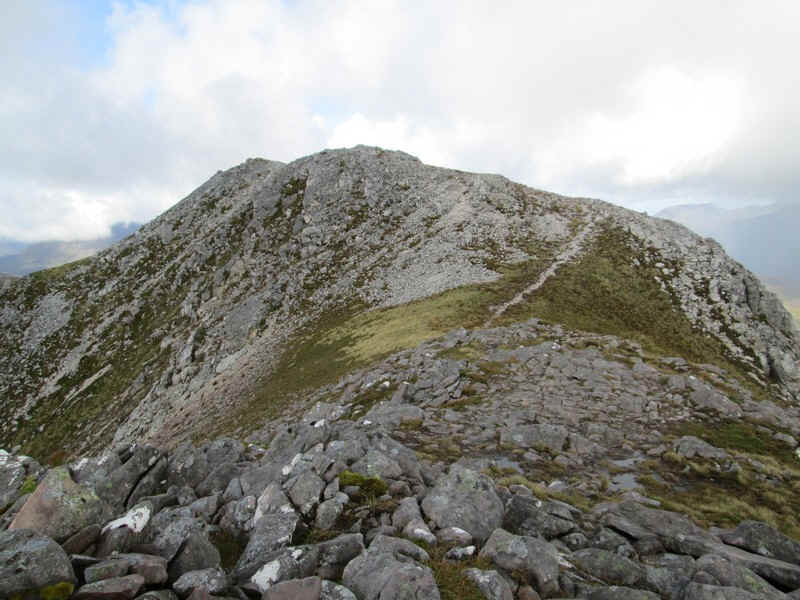 The path now climbs towards the shoulder of Droichead Coire Lair. 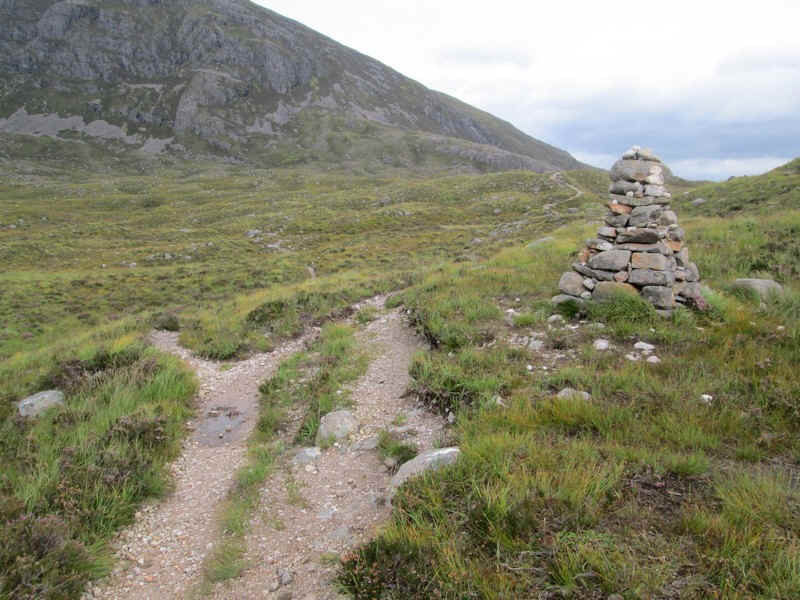 At NG 991505 there's a third cairn where the path to the hills one the left leaves the right of way down towards Coulin. 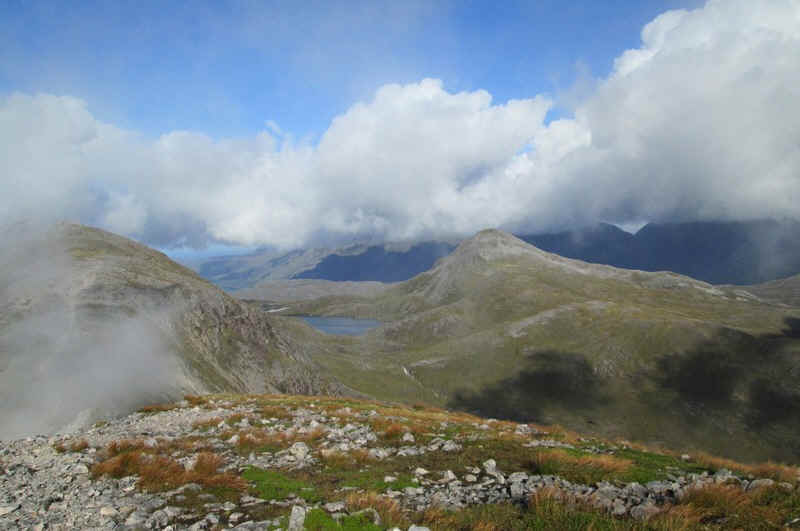 The photos from now were taken on my third atetmpt when weather conditions were dry with a gentle breeze and some drifting low cloud which gradually disperesed by late morning. 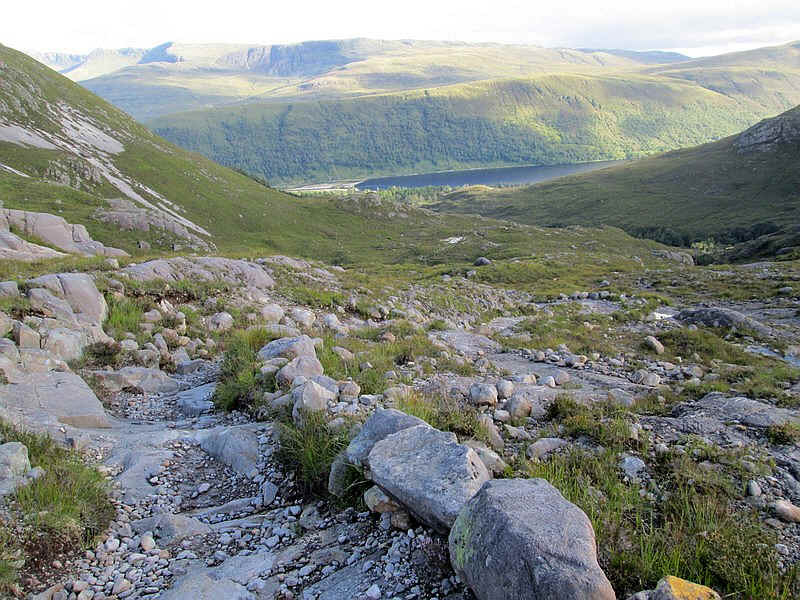 The path starts to climb steeply towards the south east top of Beinn Laith Mhor. 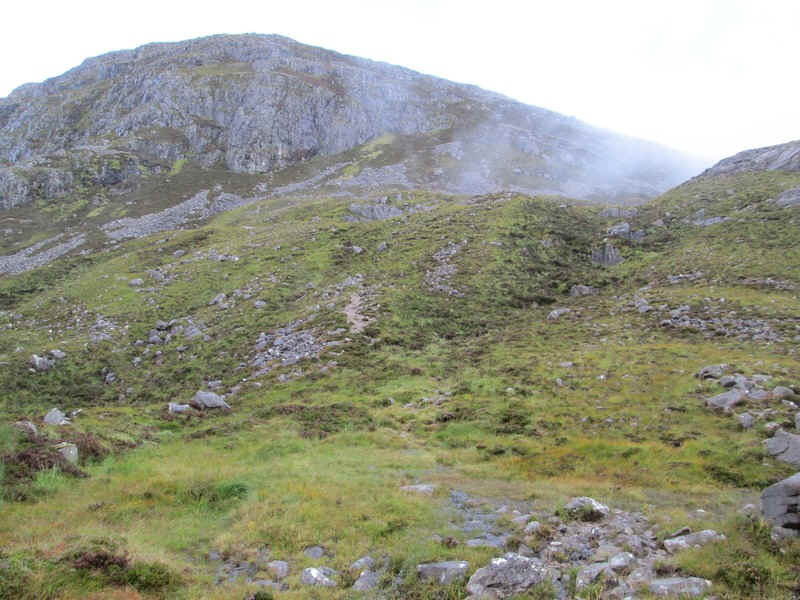 ....until the gradient eases slightly. 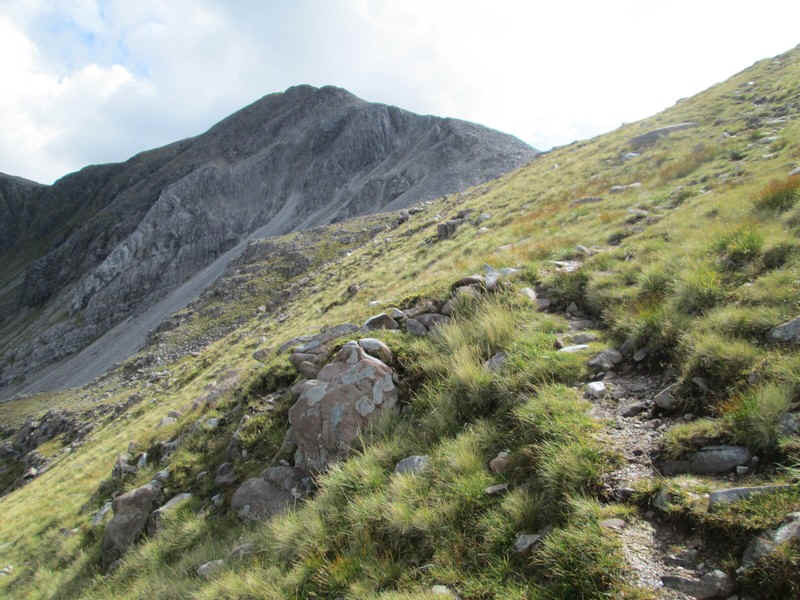 Looking back downhill towards Drochaid Coire Laire. 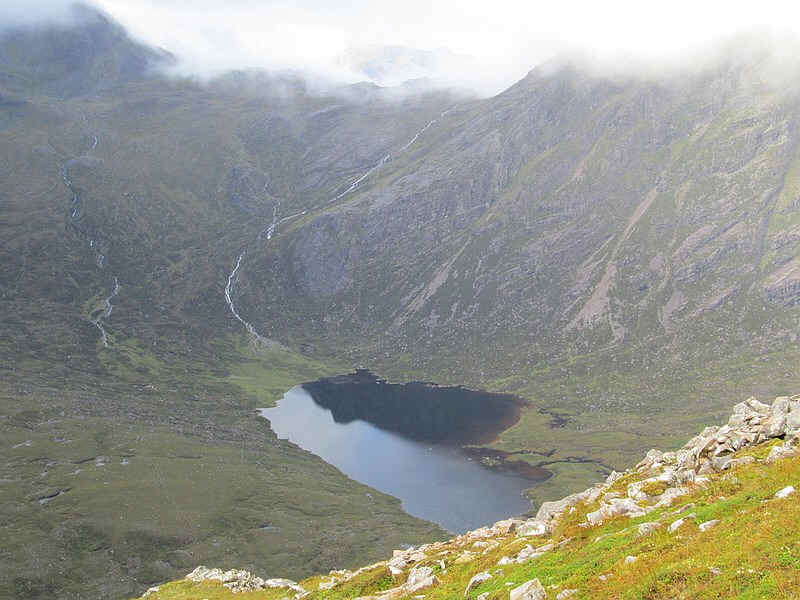 There's a super view of Loch Coire Lair. 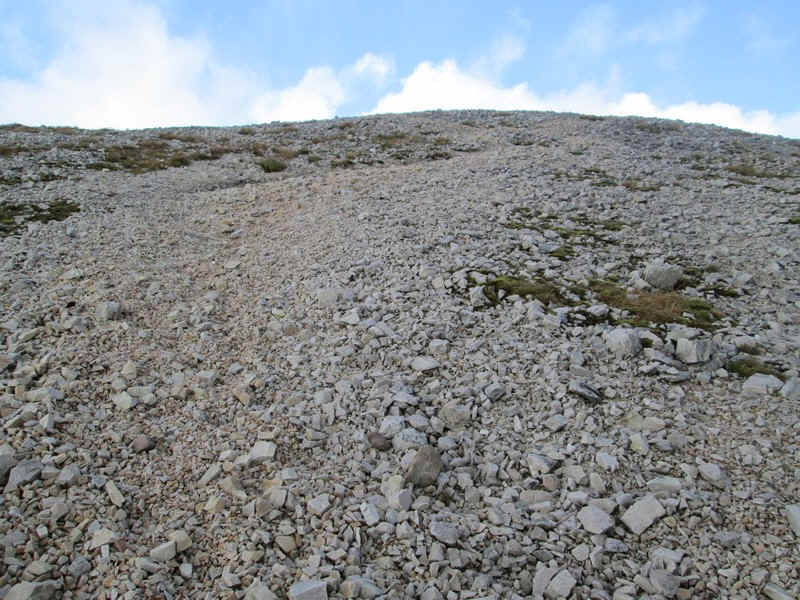 ...before levelling for the final pull towards the first summit. 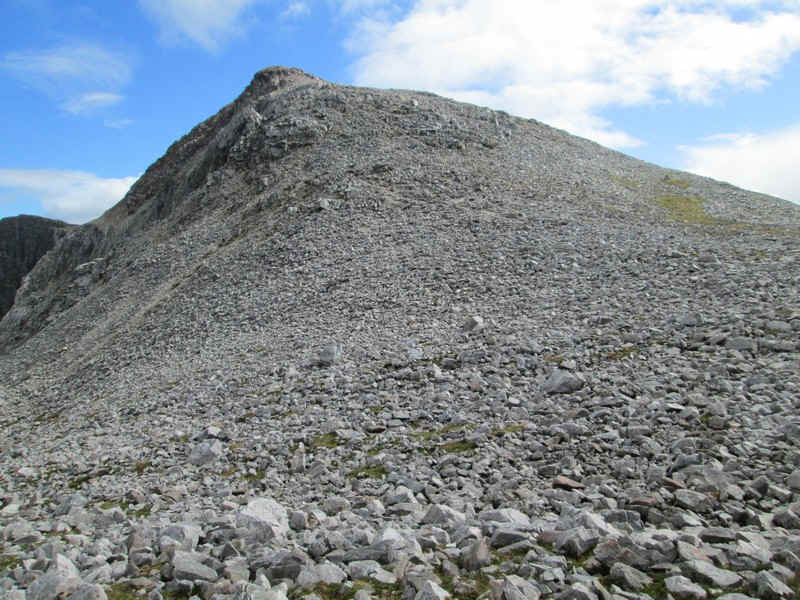 Somewhere hidden in the stones are a pair of ptarmigans which completely ignored my presence. 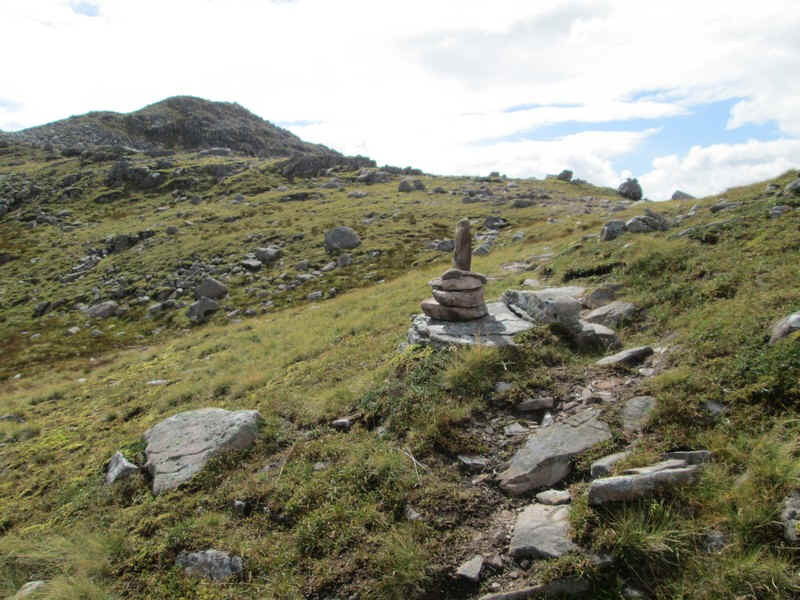 There's a substantial cairn at the 876m spot height. 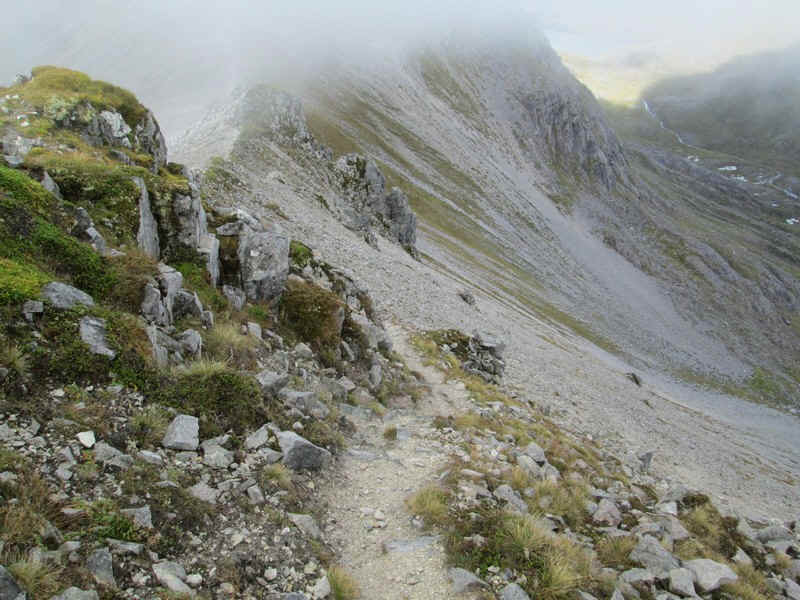 There is now a delightful 2km long ridge walking to the summit with about 193m of ascent and 143m of descent. 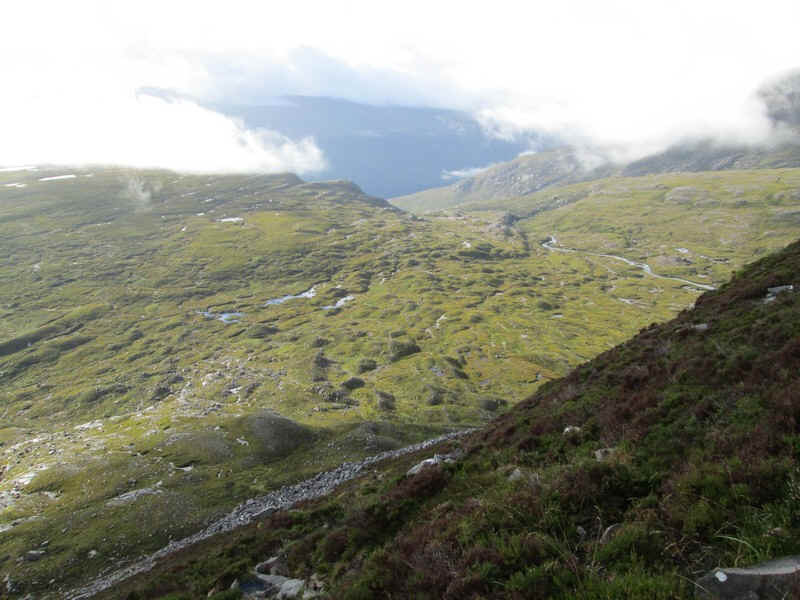 The track drops down to the first coll..
...with one or two interesting sections. 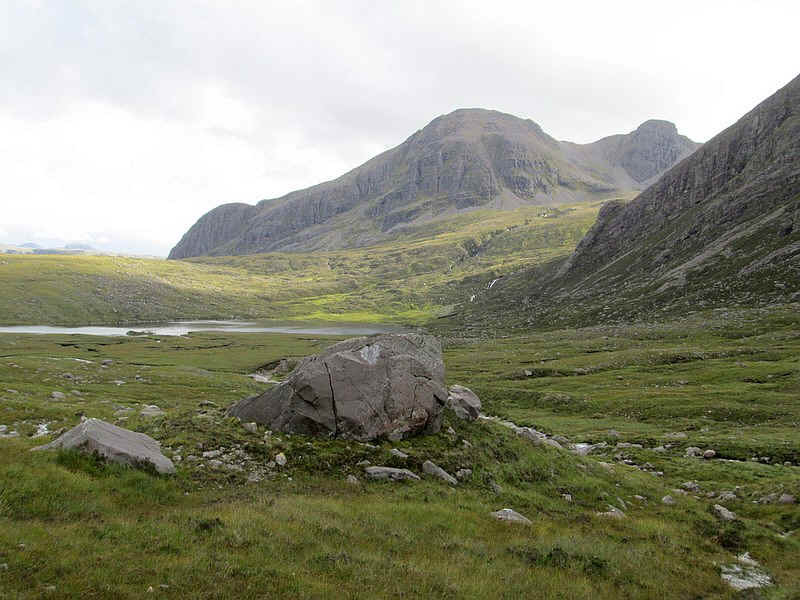 The first coll is at about 840m and has an..
....interesting rocky outcrop to pass. 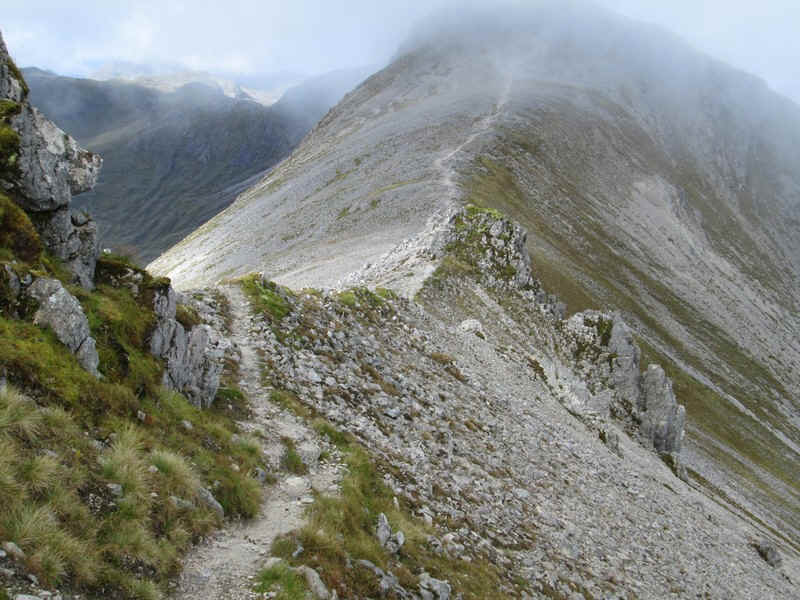 Beyond the path rises towards the middle summit. 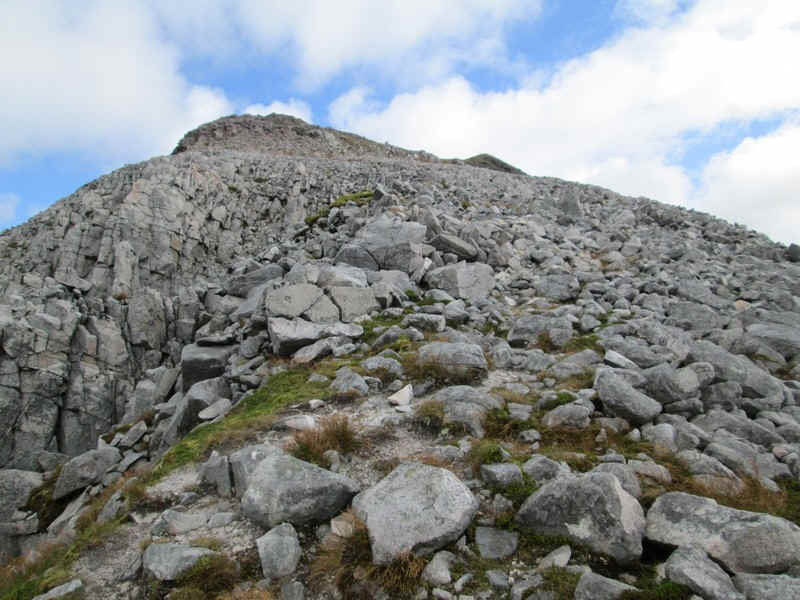 Looking back towards the south east top. 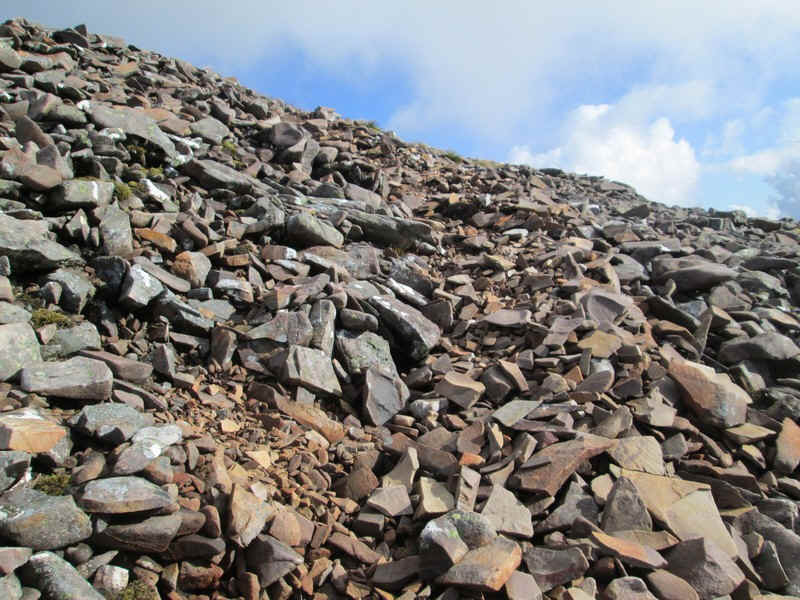 The climb to the middle summit is over shattered stones. 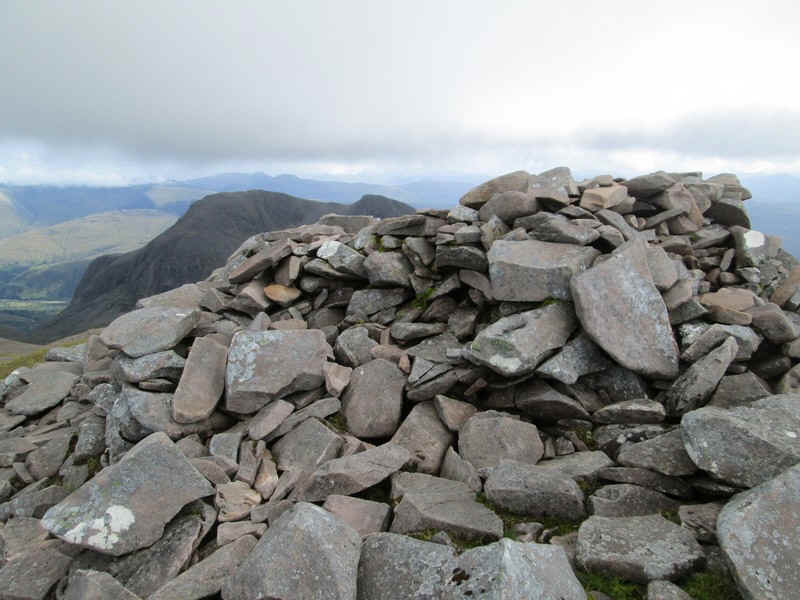 Beinn Liath Mhor's summit cairn comes into view although it's still over a kilometre away. 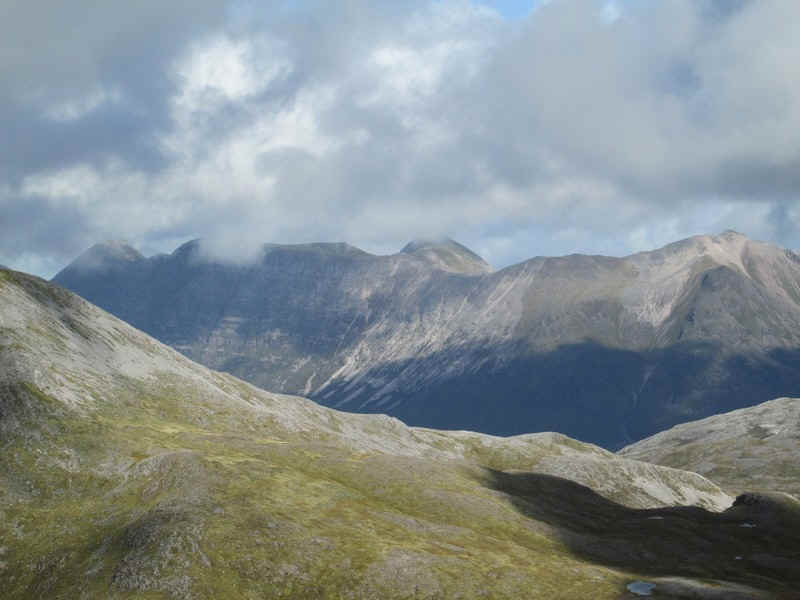 ....and Beinn Eighe with Beinn Liath Bheag (737m) in the foreground. 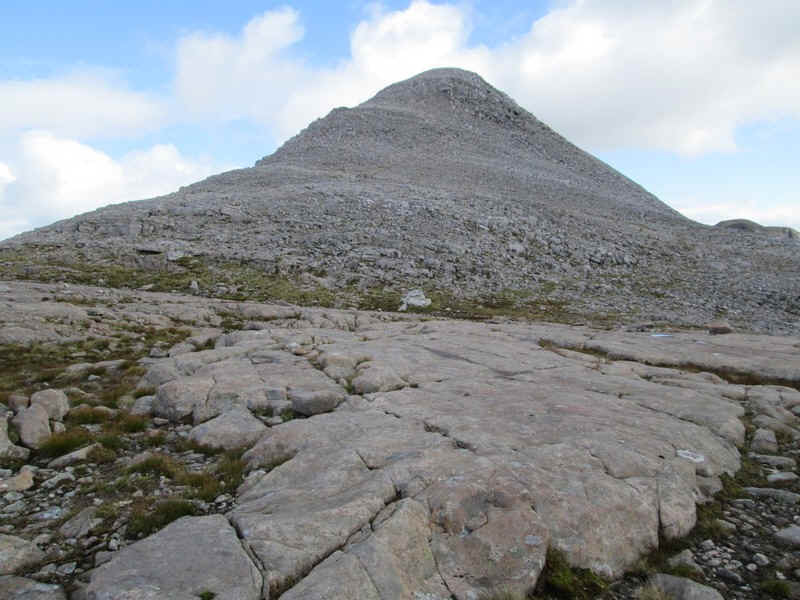 The 887m high middle top is marked by a small cairn. 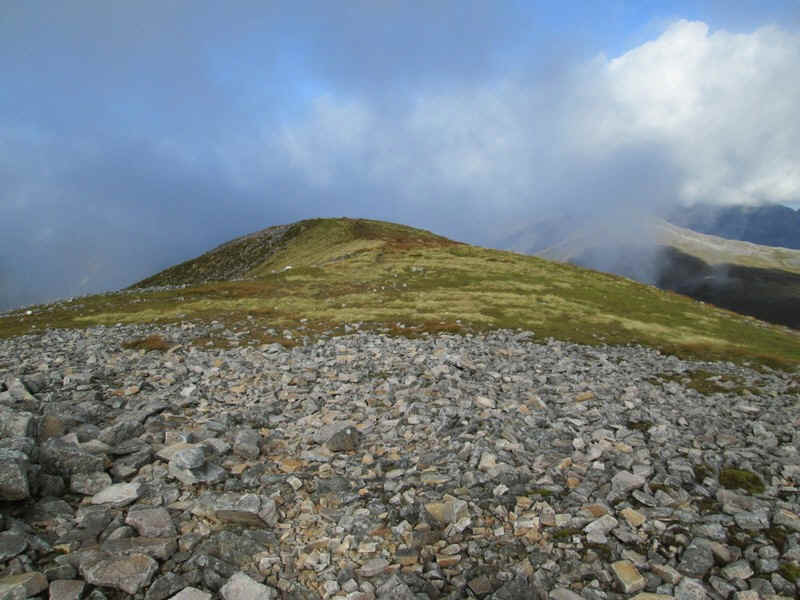 The final stage of the ridge walk has the summit clearly in view. 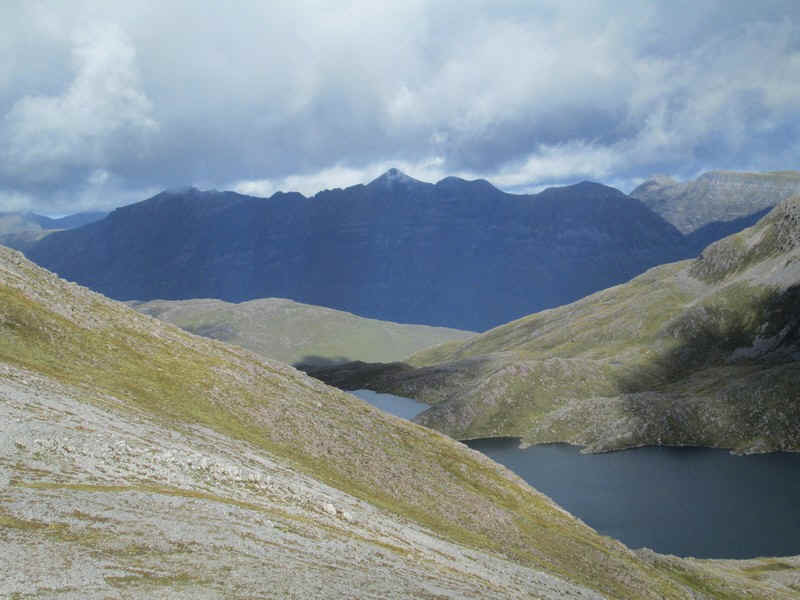 Sgorr nan Lochan Uaine is seen above the three lochans of the same name. 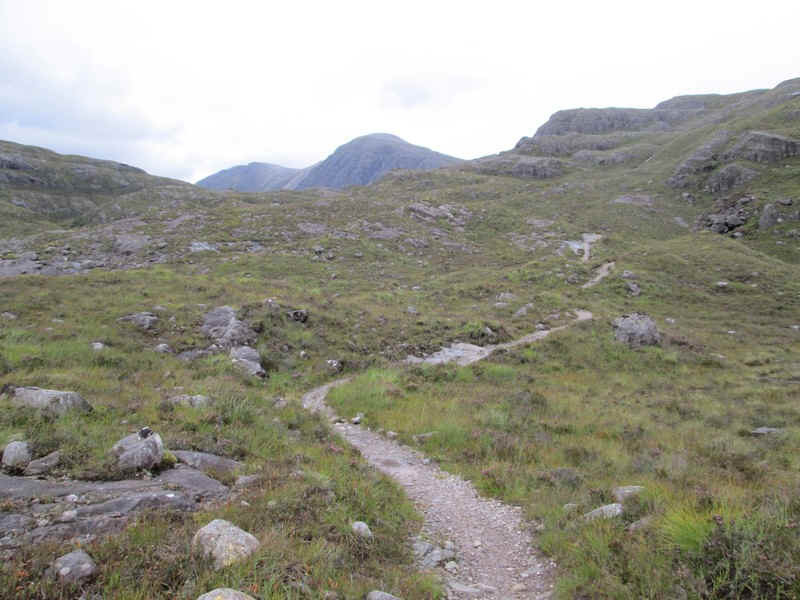 The path now drops about 50 metres ..
...and then you're at the coll. 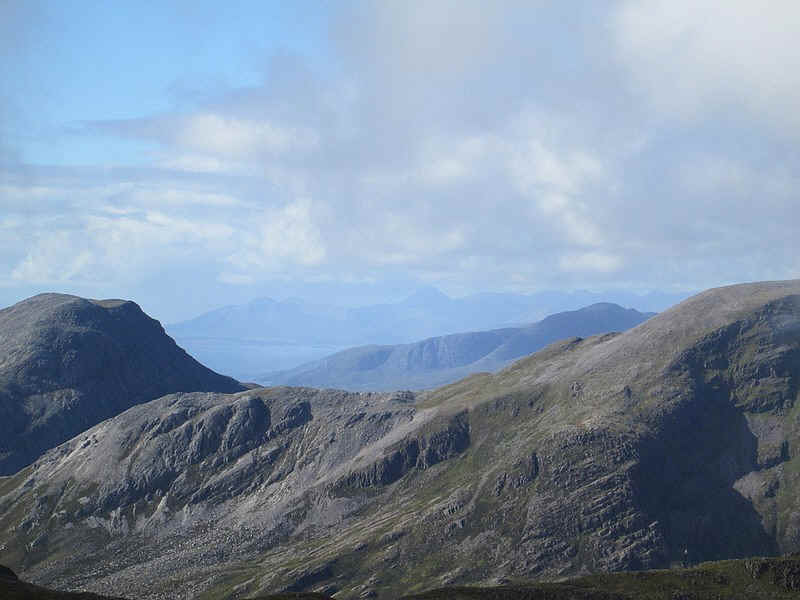 Across Glen Torridon, The Pinnacles on Liathach stand out well in silhouette. 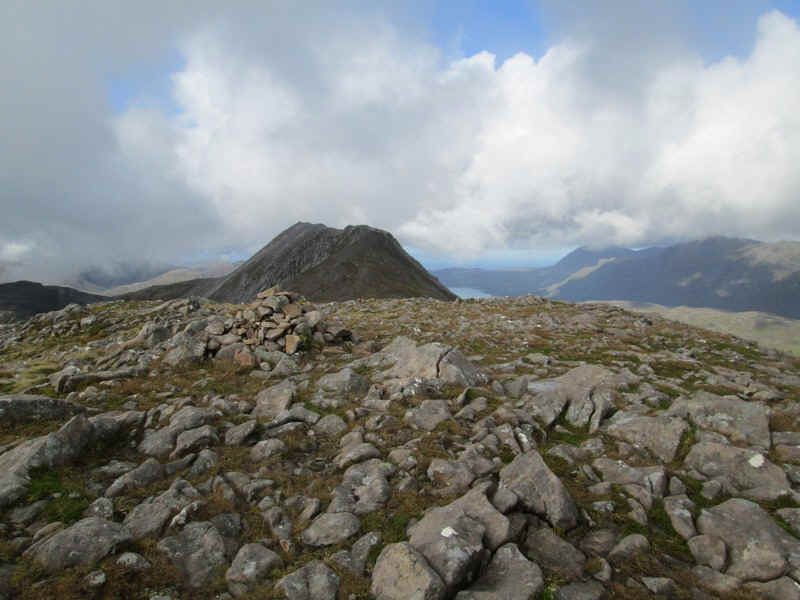 Looking west from the coll Sgorr Ruadh is clear of cloud. 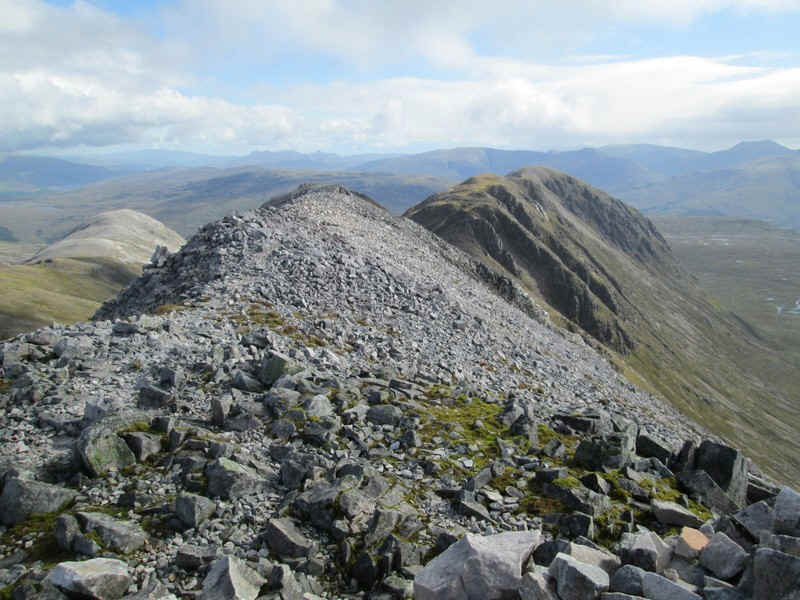 The climb from the coll is across more stones. 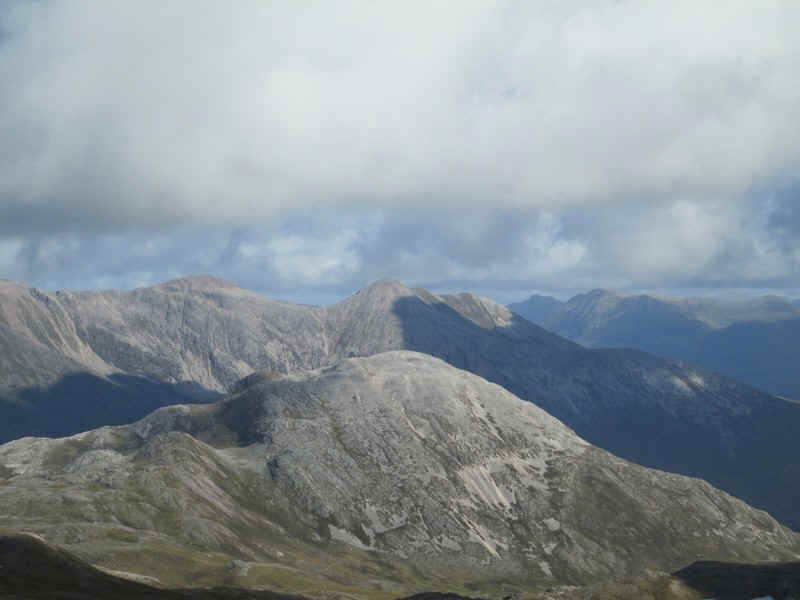 Click on the photo for a panoramic image looking south east. 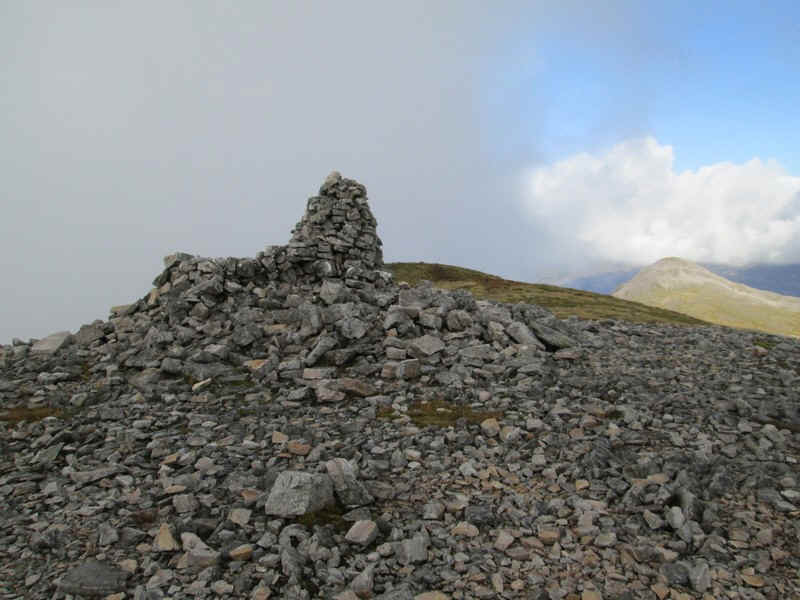 The summit cairn and shelter. 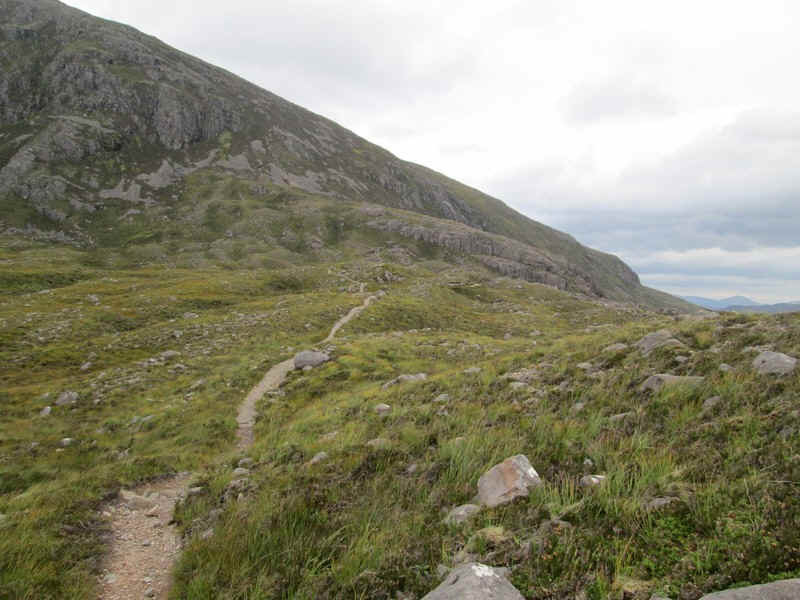 I'd taken about 3 hours 45 minutes from the Achnashellach almost exactly what is suggested in the Cicerone munro guide. 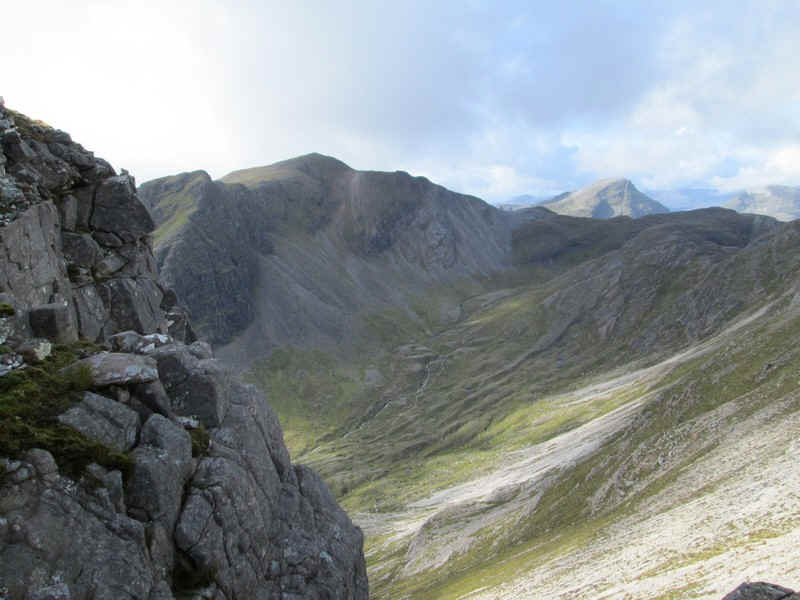 The reward for all this effort was of course the views. 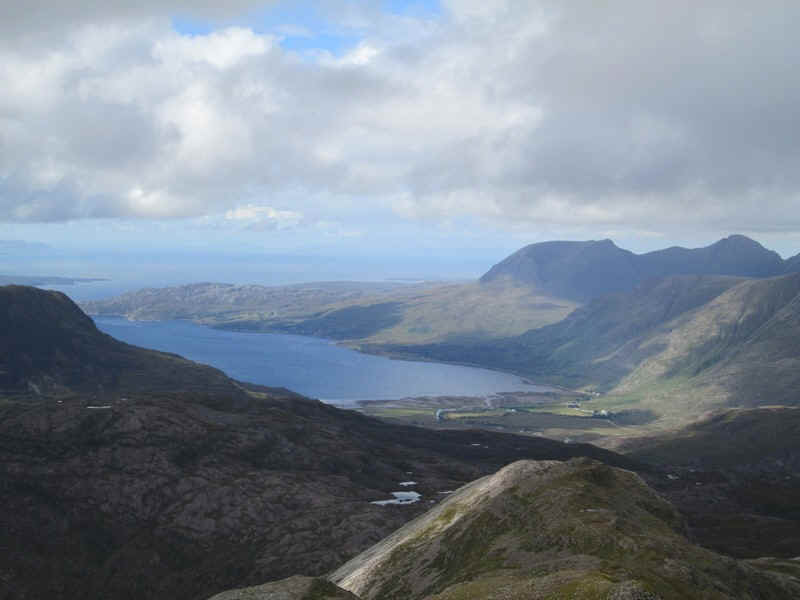 In the distance the Trotternish peninsula on Skye can be seen and the three linked lochs of Loch Torridon, Loch Shieldaig and Upper Loch Torridon. 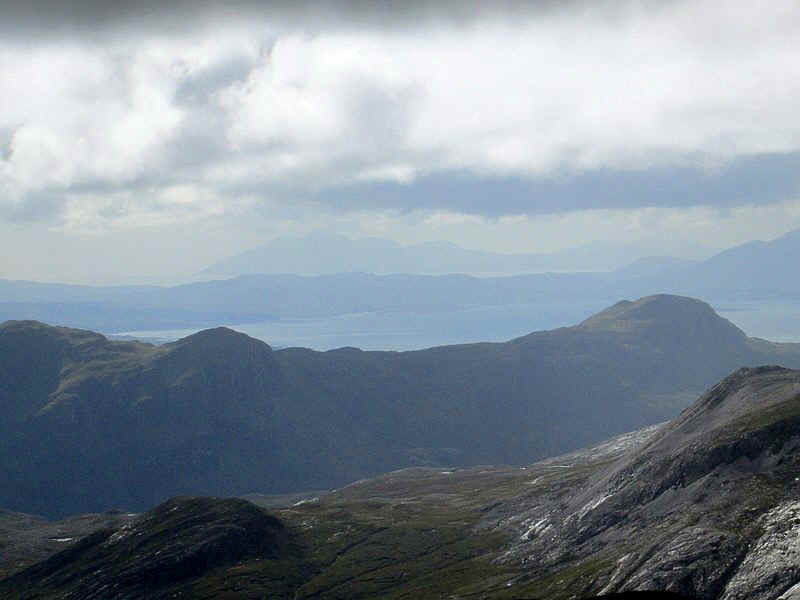 A telephoto shot looking across to the Cuillin mountains on Skye - nearly 35 miles away. 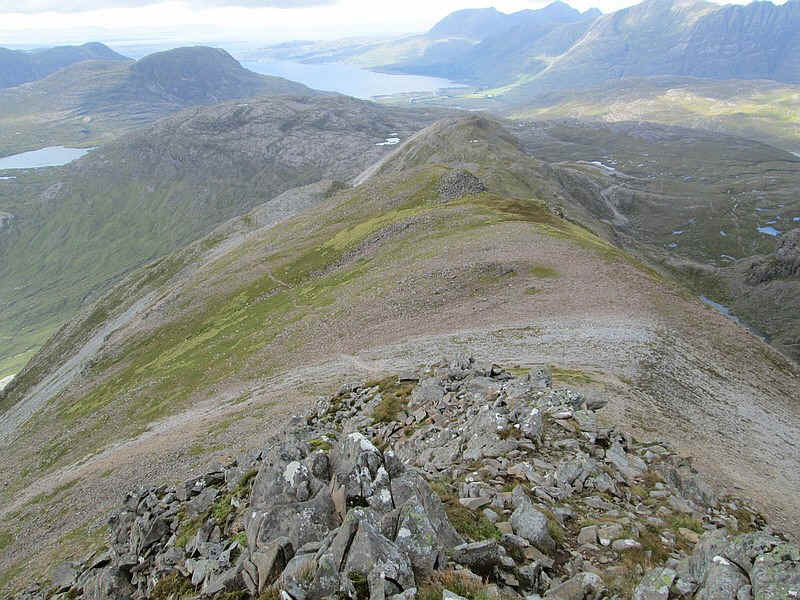 After an extended lunch break the way on to the next Munro starts off down the west ridge over stones. 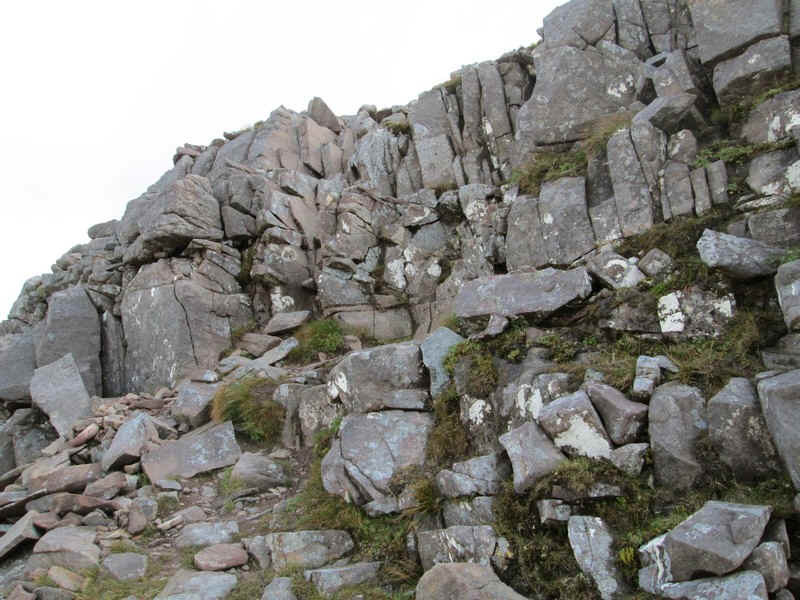 ....goes straight across this enormous area of sandstone slabs or pavement. 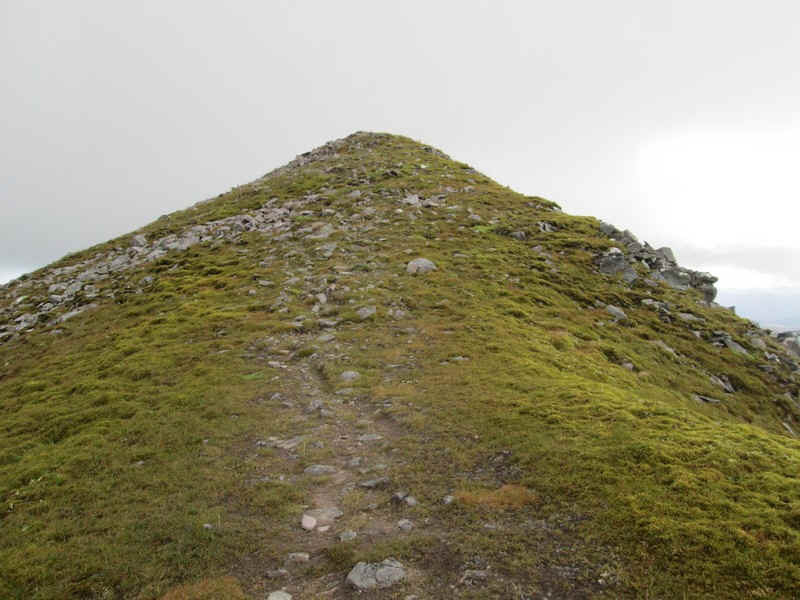 I suspect in bad visibility it might be tricky to navigate here but I knew exactly where I was going - grid reference NG 96409 51968 - using my GPS to take me to a small cairn. 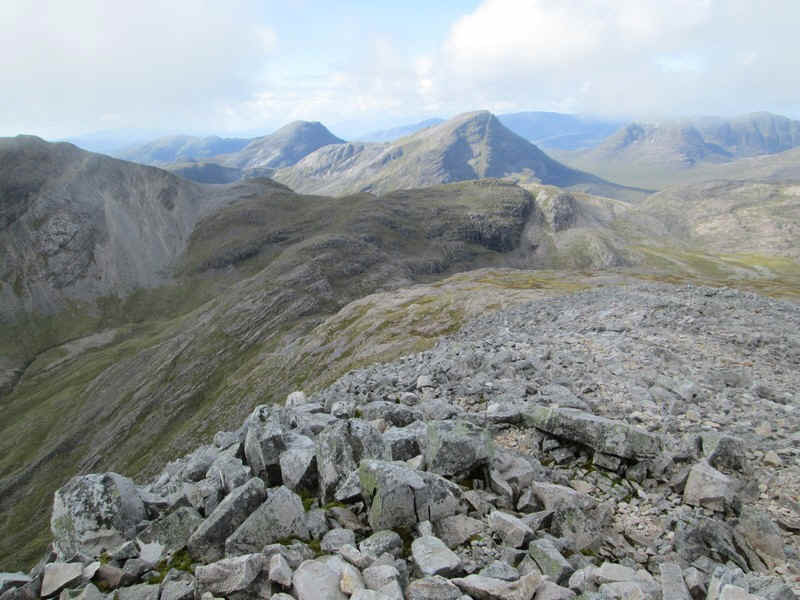 Looking back to Beinn Liath Mhor. 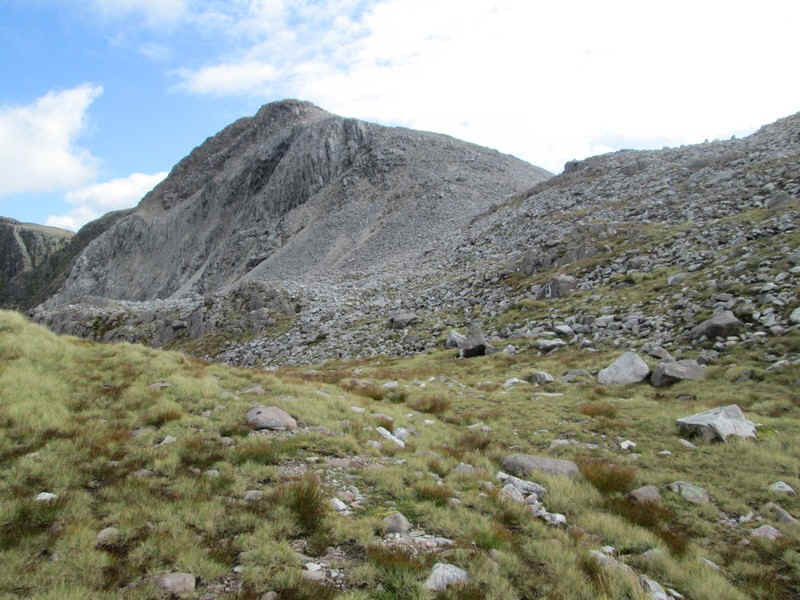 ....and there is the cairn I need (in the centre of the photo). 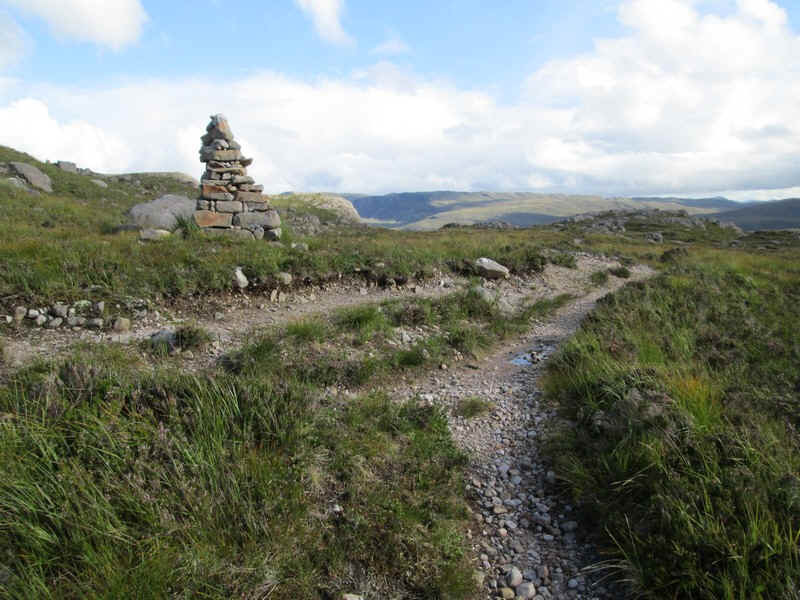 The cairn marks the spot where a path squeezes down through crags. I'd read about this and was a bit worried what it would be like but in reality it's safe and easy. 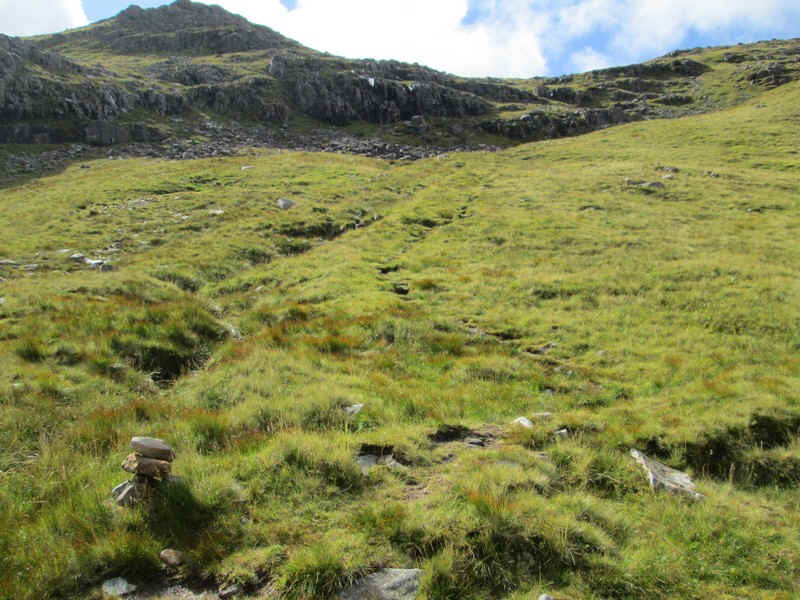 The path drops down to another cairn at the end of a tiny lochan. 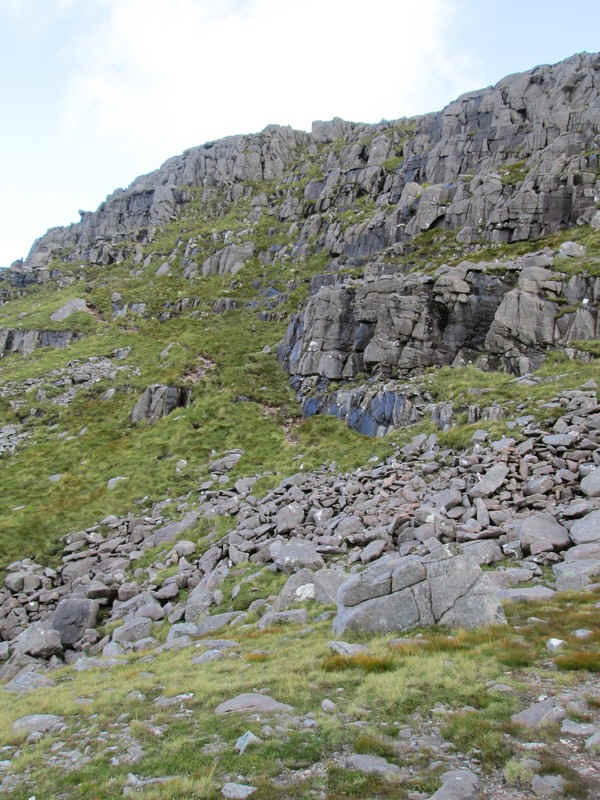 Looking back up through the crags. 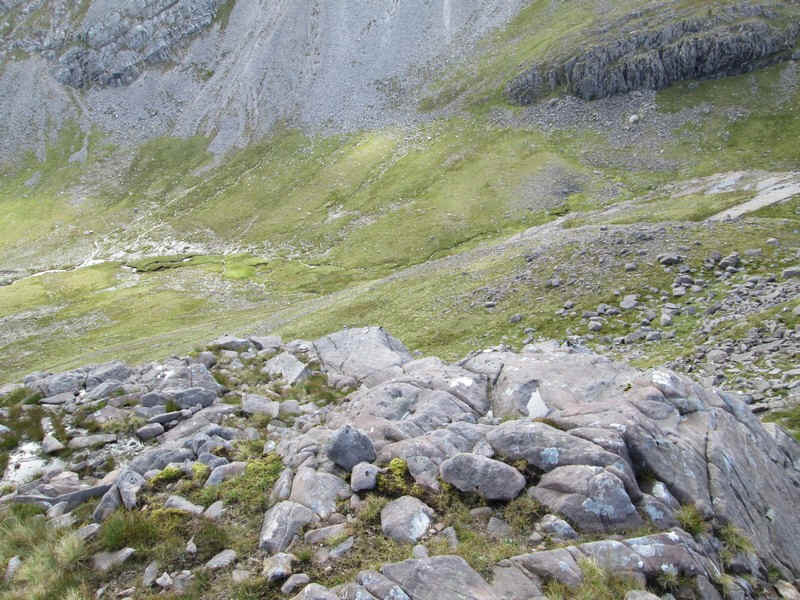 Looking in the opposite direction there's a tremendous view looking down Coire Lair. 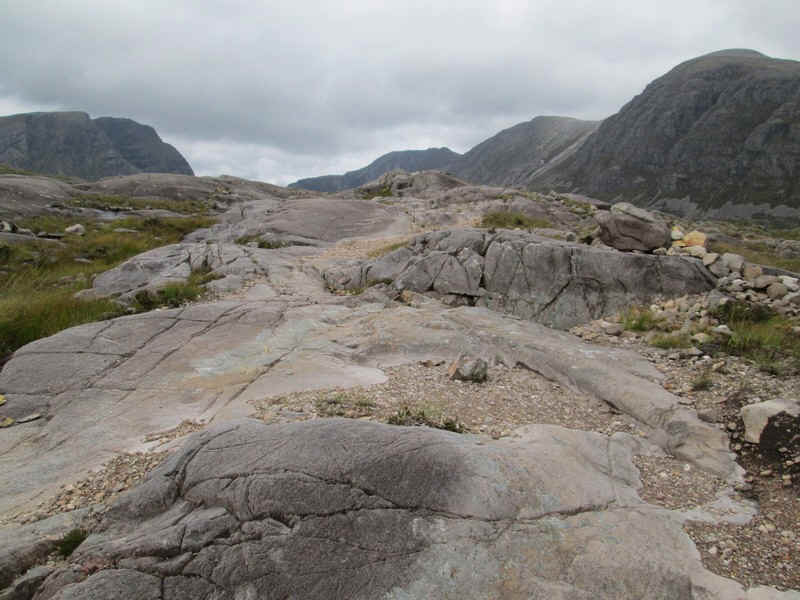 Click on the photo for the full sized panorama. 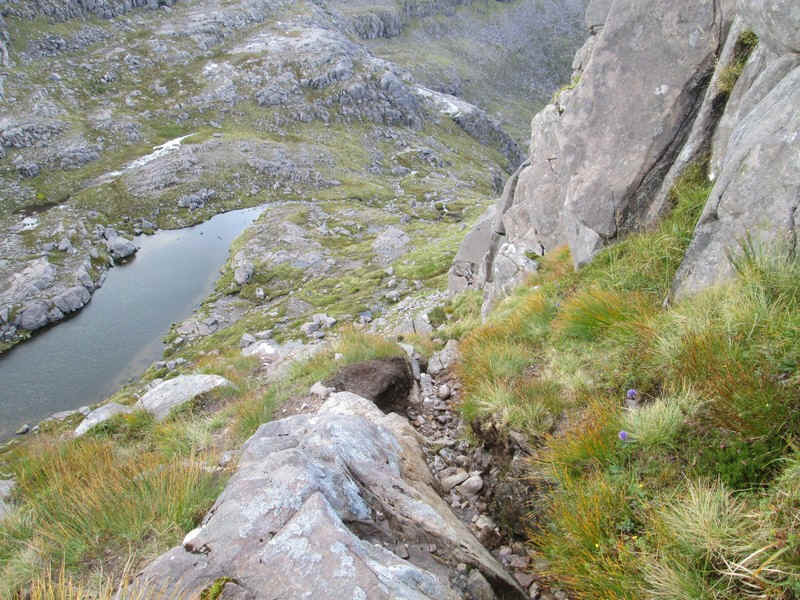 ....and then drops down to the main path up Coire Lair. 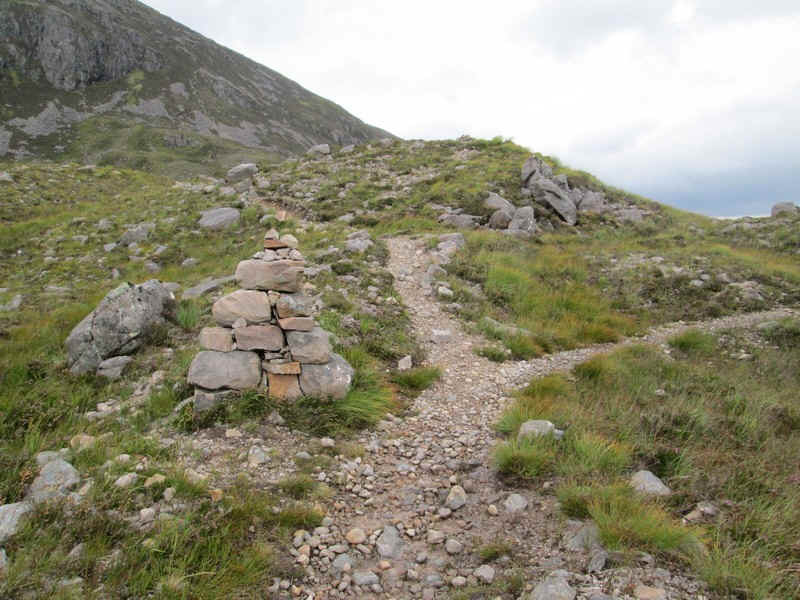 .....where there is a tiny pile of stones marking the beginning of the path uphill. 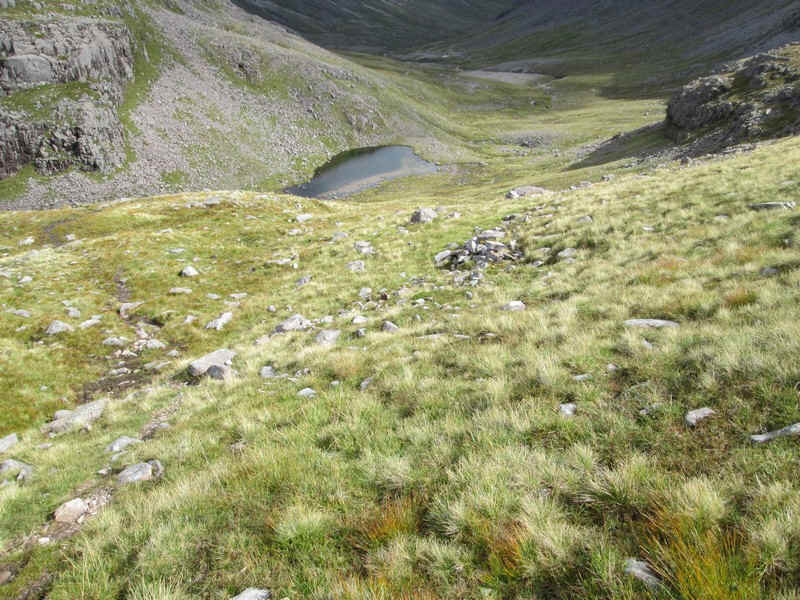 Looking back down to the lochan. 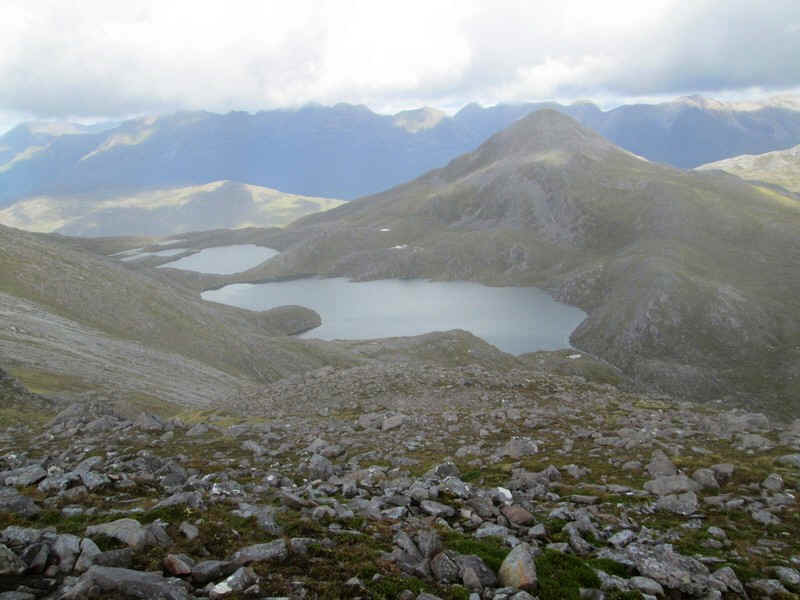 A panorama photo showing the Munro Maol Chean-dearg (933m) and Loch an Eion. 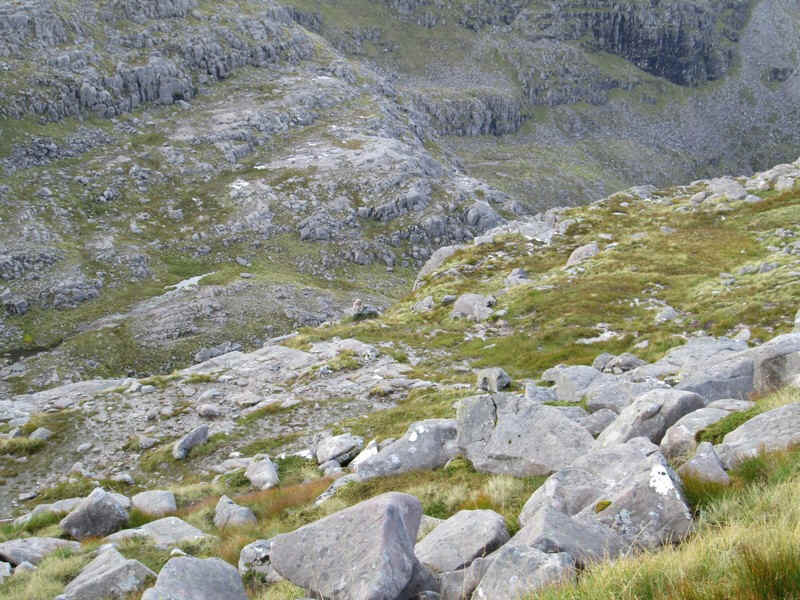 Click for a larger image. 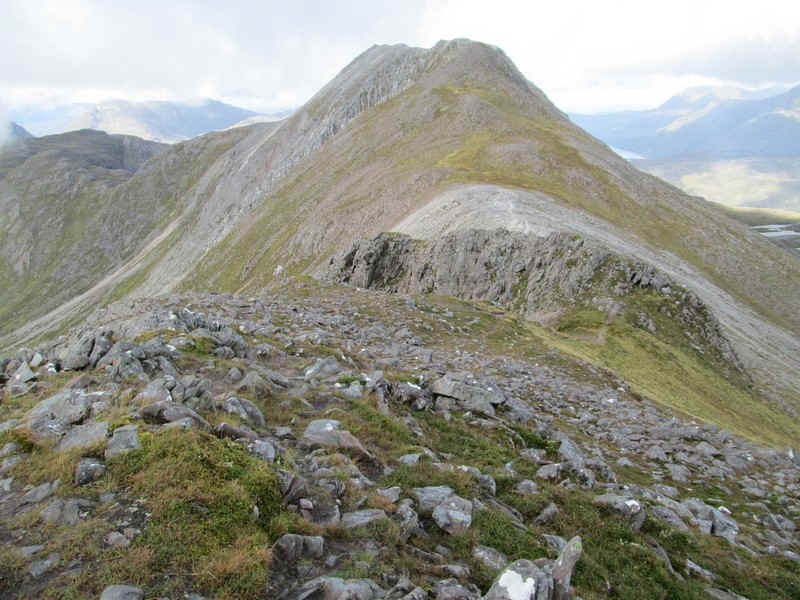 To the right is the long ridge of Beinn Damh (901m). 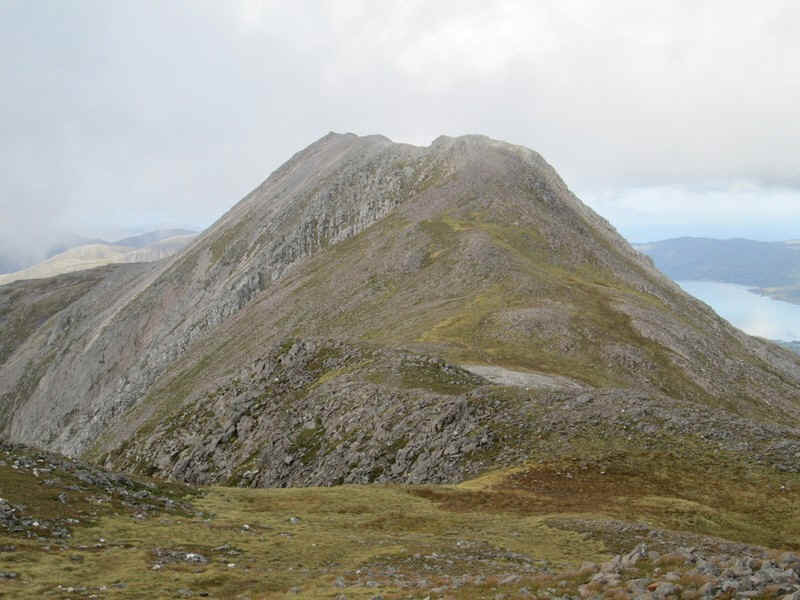 I'd hoped to climb this hill from Coulags two days before, but weather conditions were so bad that I abandoned the walk. 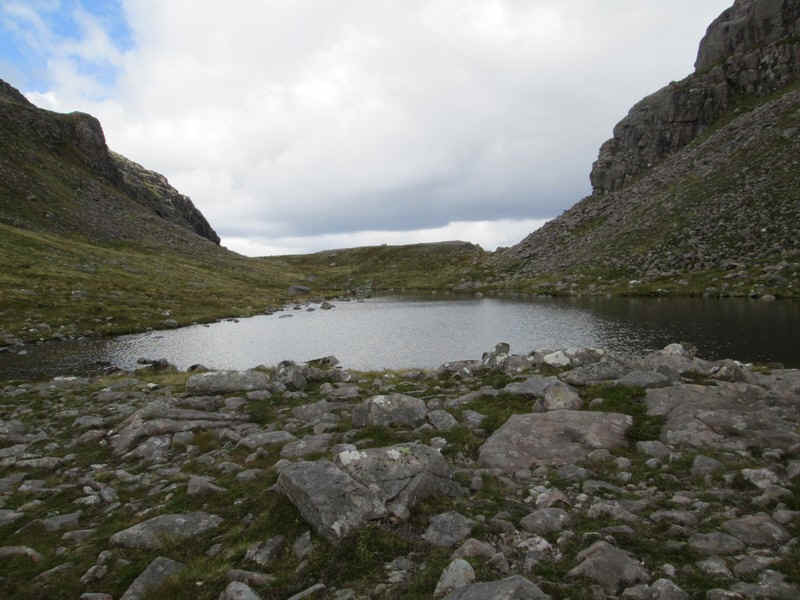 .....passing this delightfully situated lochan. 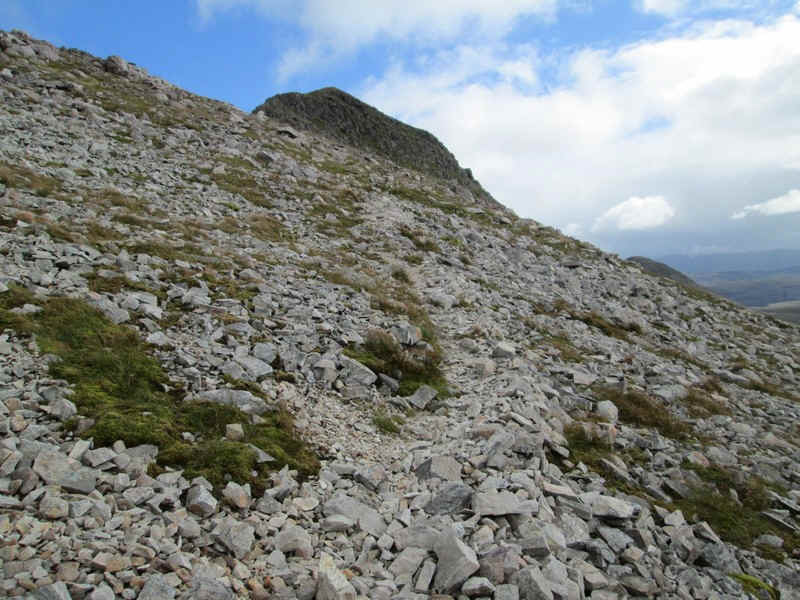 This wasn't a sight I wanted to see nearly seven hours into the walk- no path and scree and boulders. 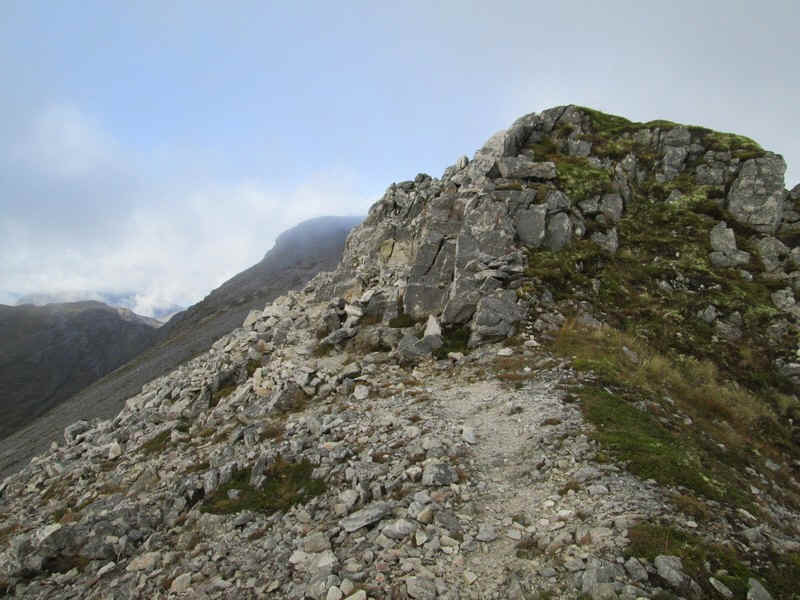 I decided that there must be a path somewhere so crossed over to the top of the ridge to see if it was there. 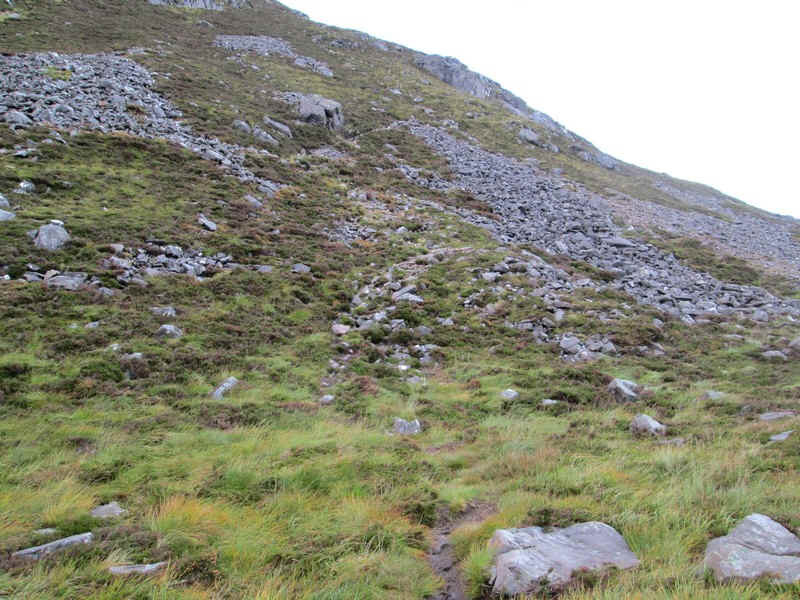 A faint path headed across some of the few areas of grass. 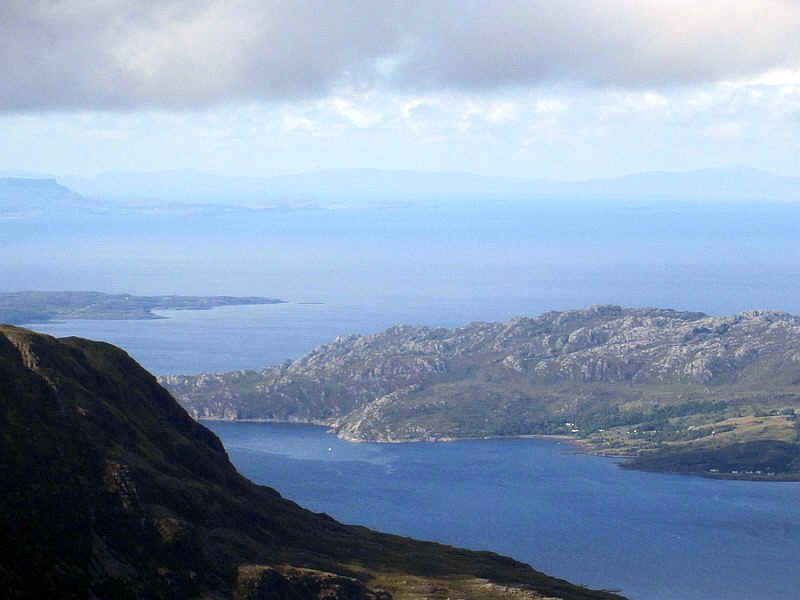 Looking sown to Loch Carron with the village of Strathcarron at its head. 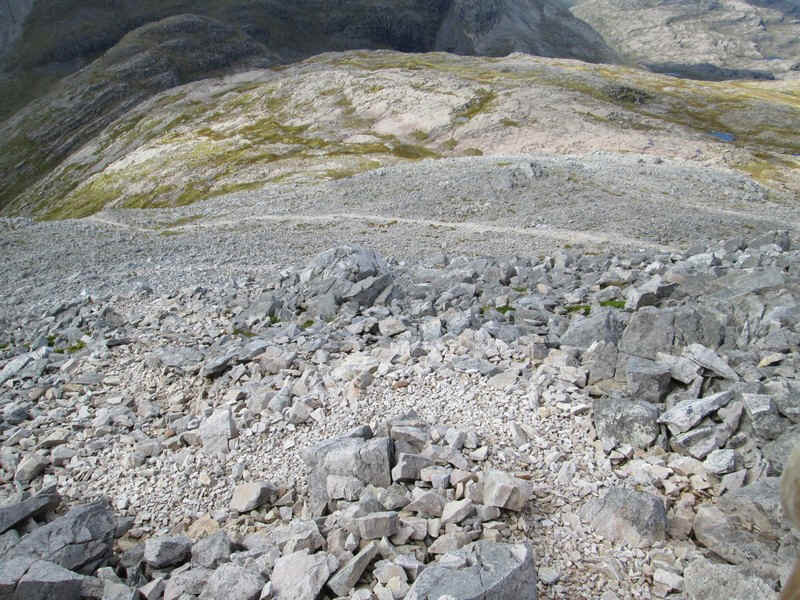 The track heads up through scree and boulders. 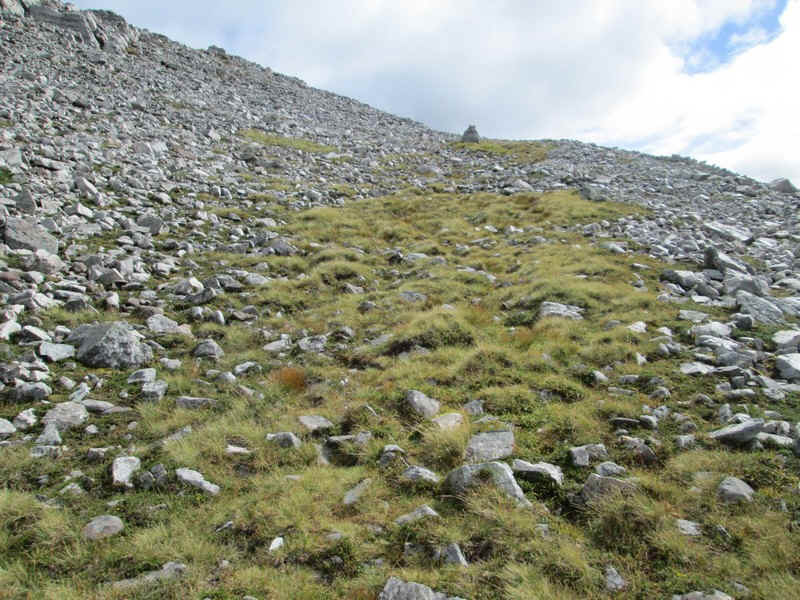 ....keeping on the west side of the hill..
...to suddenly reach an easy section just below the summit. 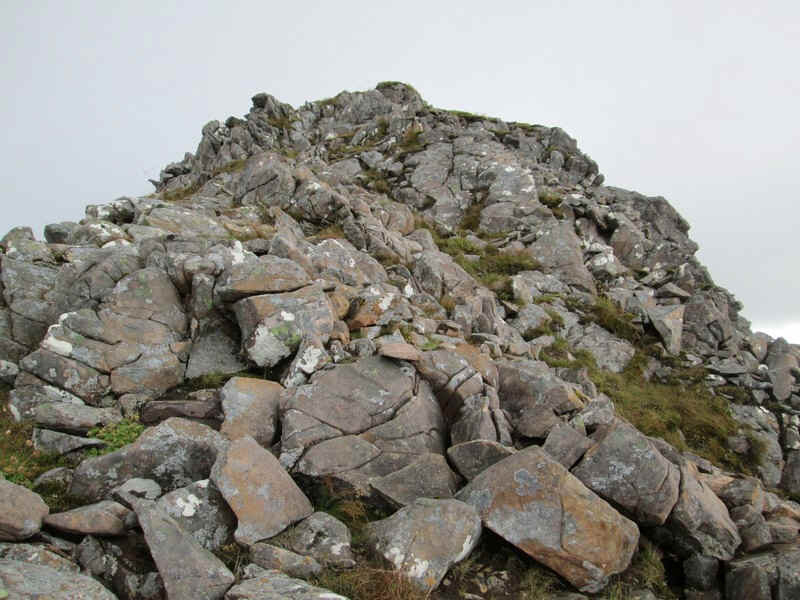 ...and the cairn at 962m. 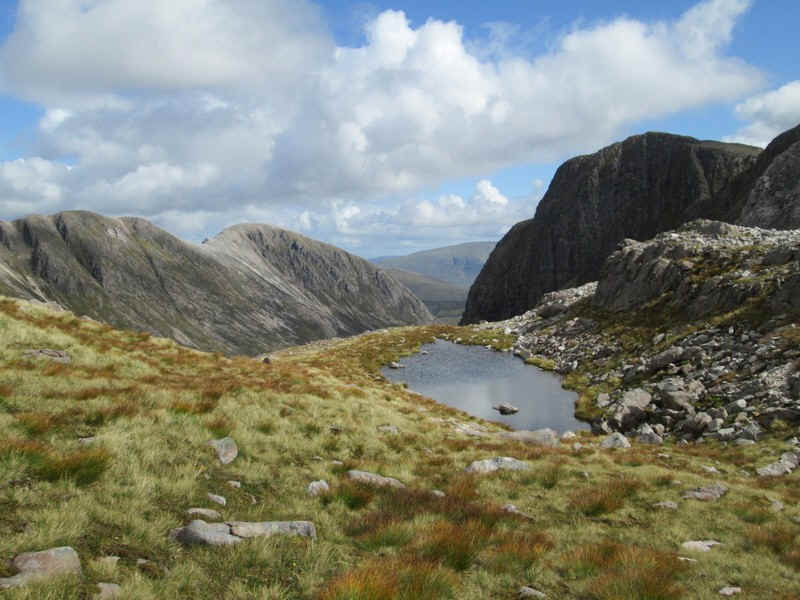 Across the glen to the west are An-ruadh Stac (892m) and Maol Chean-dearg (933m). 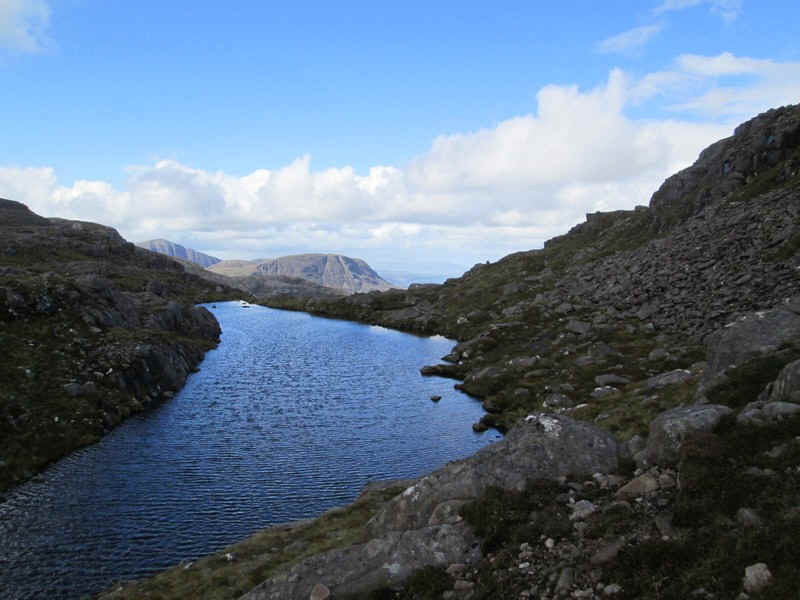 Loch Coire Fionnaraich is below. 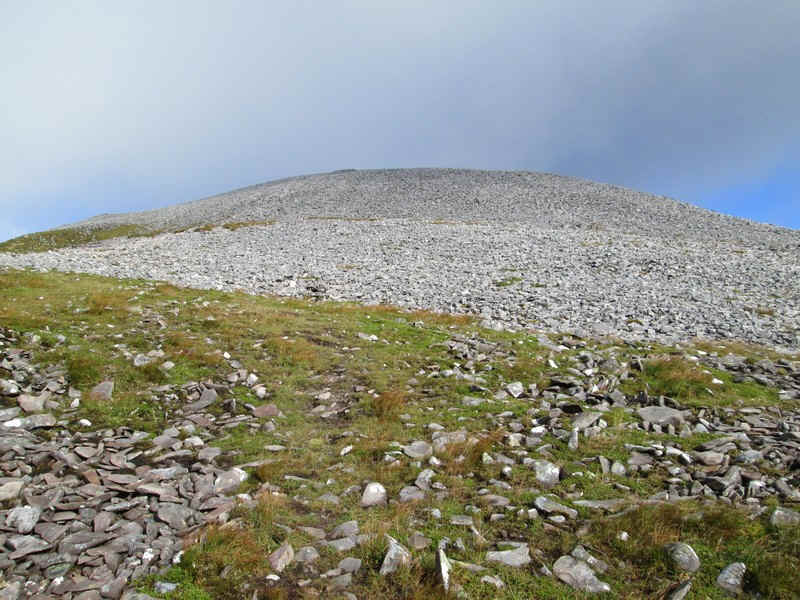 I really will have to go back and try to climb this hill! 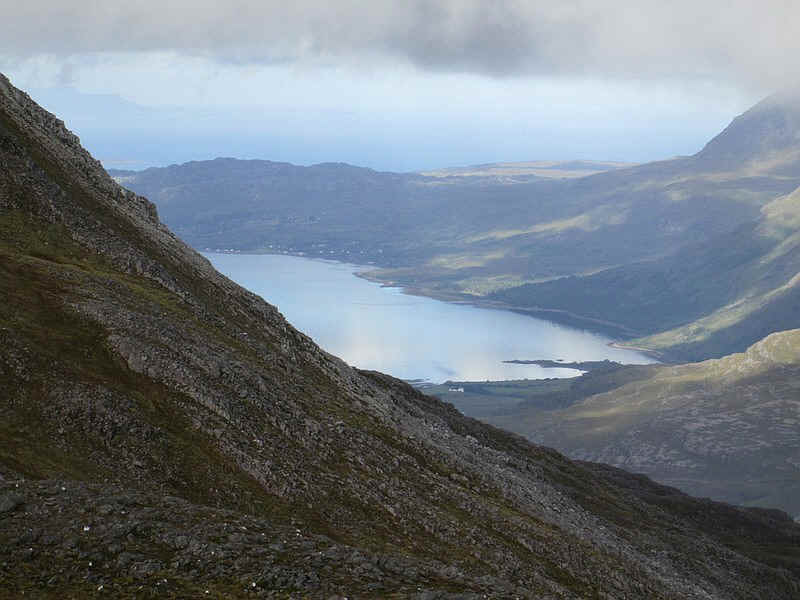 Looking acoss Upper Loch Torridon. 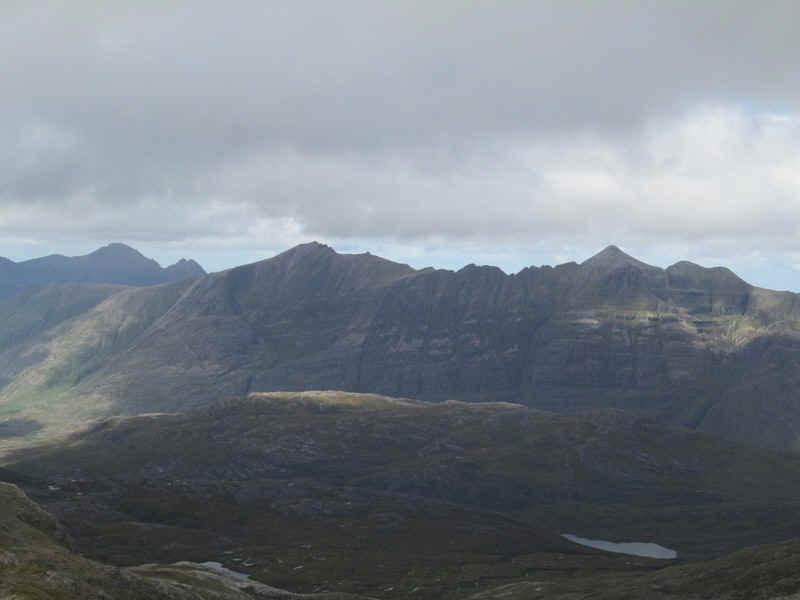 The sun had moved around and was now shining on The Pinnacles of Liathach (1053m). 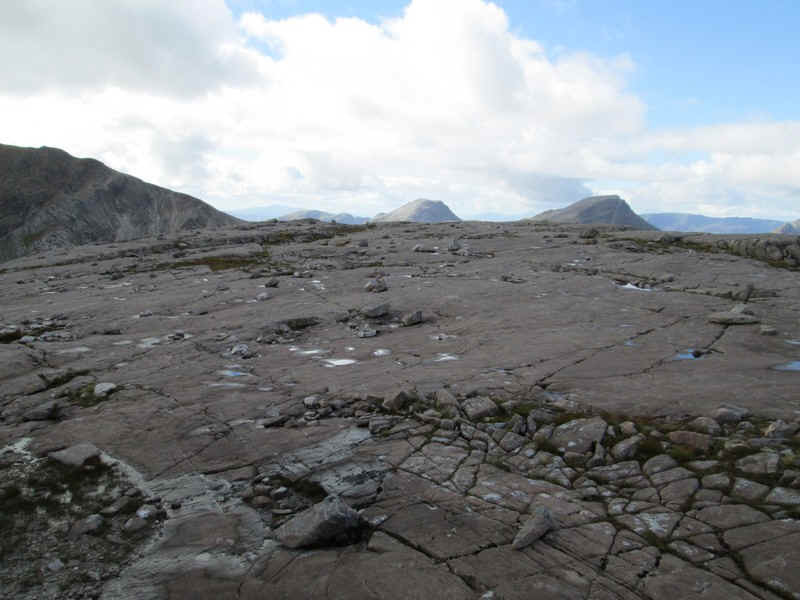 Over to the left is Beinn Alligin. 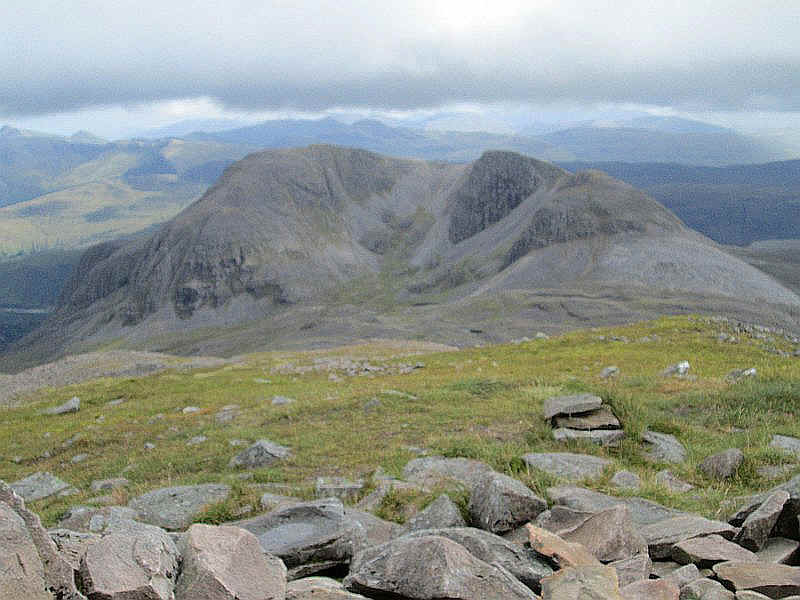 A panormaic view looking south east. Click for a larger image. 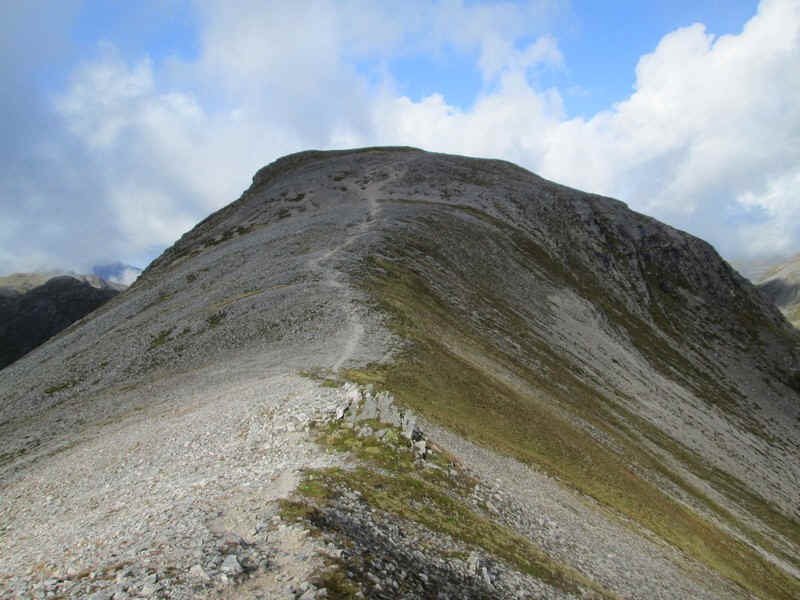 The normal return route from Sgorr Ruadh to Achnashellach heads off down the ridge towards the bealch opposite Fuar Tholl (907m). 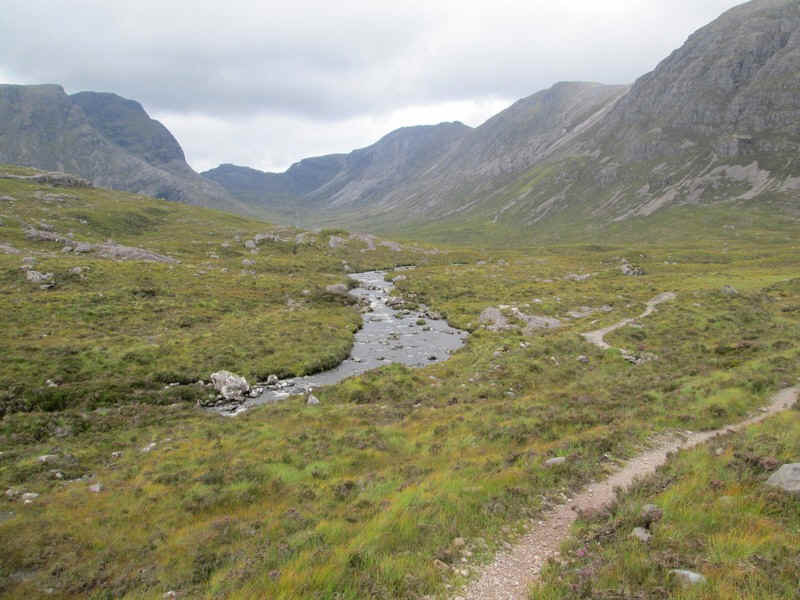 However, because the river was in spate I'd decided not to use this route but to return via the Coire Lair path. 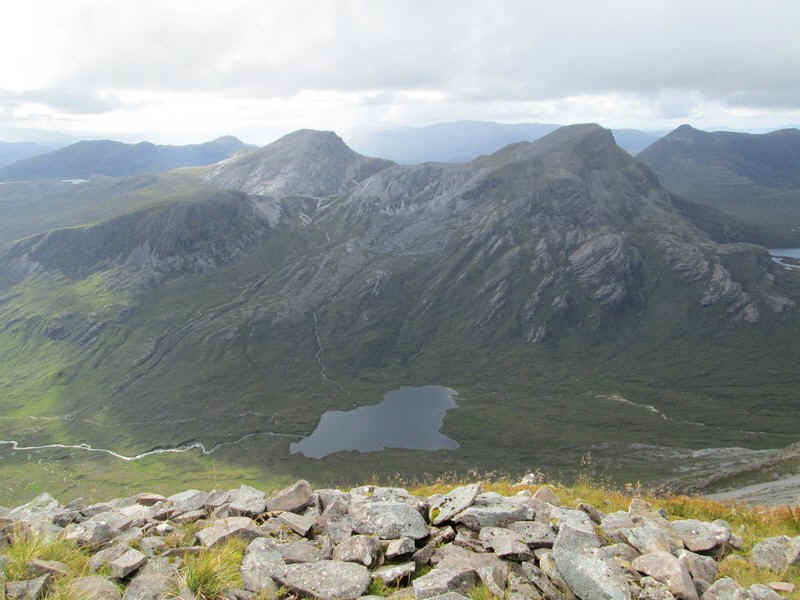 The air clarity had been improving all day and by early afternoon it was possible to see out to Outer Hebrides. 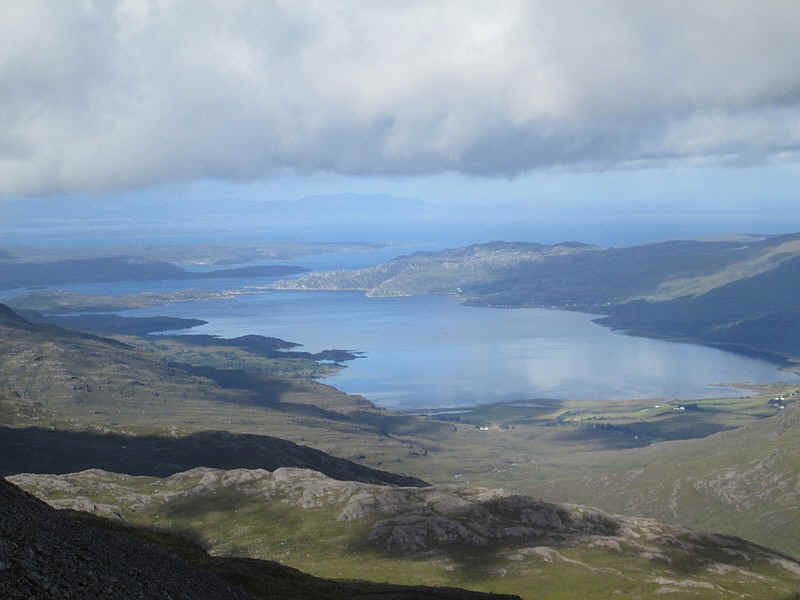 This telephoto shot shows Harris and the southern part of Lewis roughly 60 miles away. 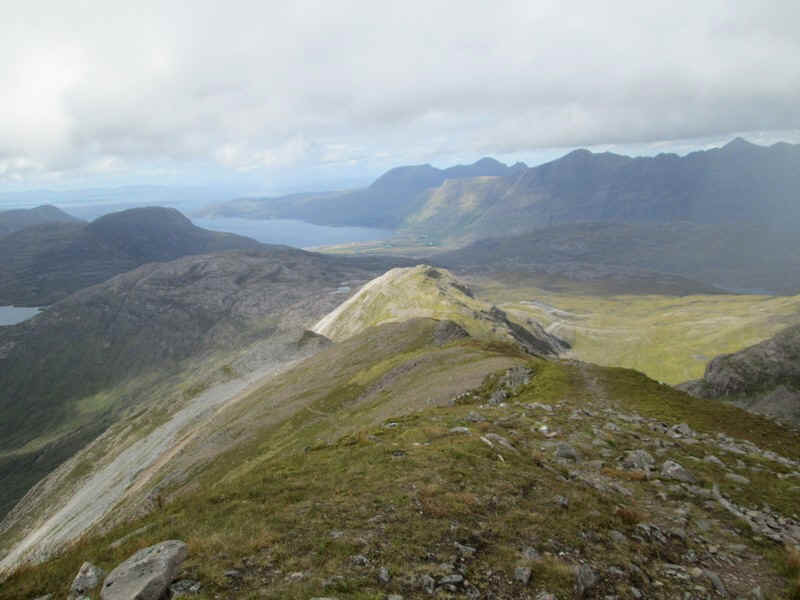 To the south west the isle of Rhum can be seen over the southern end of Skye (about 45 miles away). 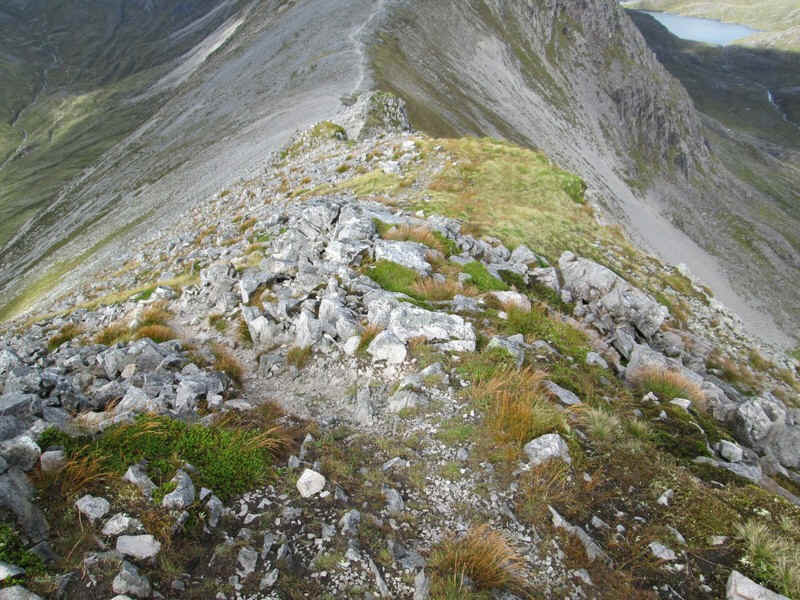 Looking down the ridge from Sgorr Ruadh on the return to the Coire Lair path. 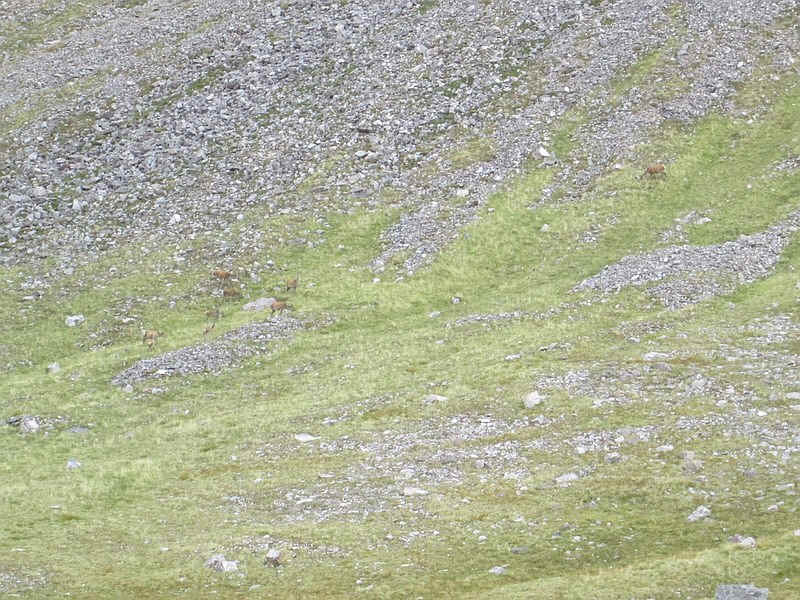 There were plenty of deer in Coire Lair. 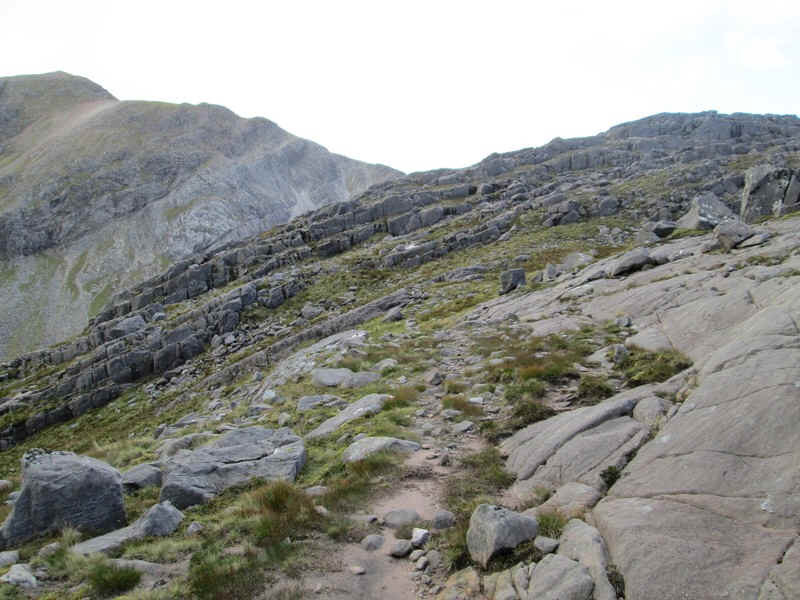 Heading back down hill on the path through Coire Lair. 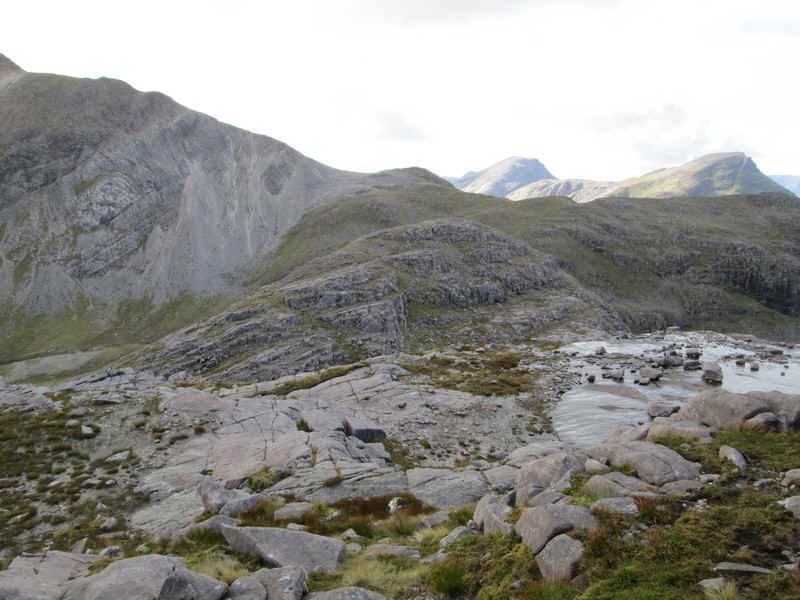 There are plenty of glacial features in this valley - rock steps, morraines and drumlins. 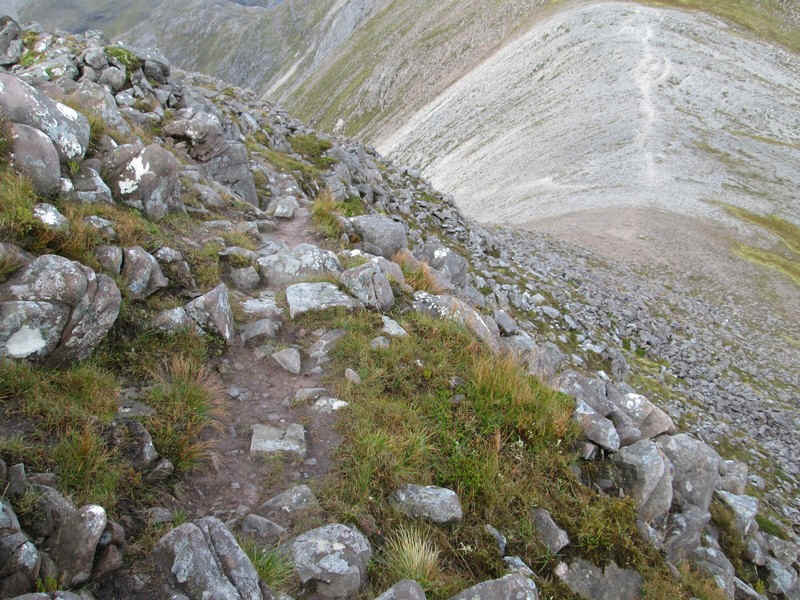 A final look back up Coire Lair on an early September evening. 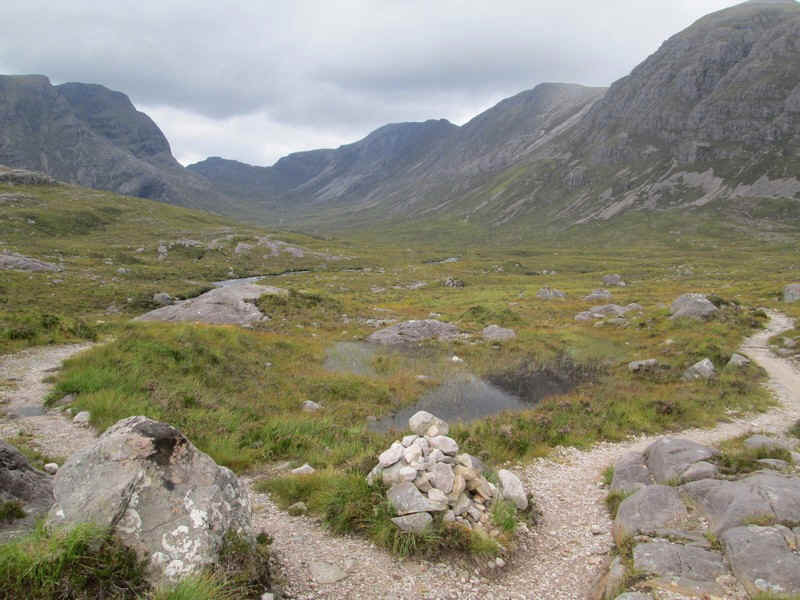 The Coire Liar path ends at this cairn..
.....and it's just a gentle walk downhill back to the station. I arrived there just before 18:00. 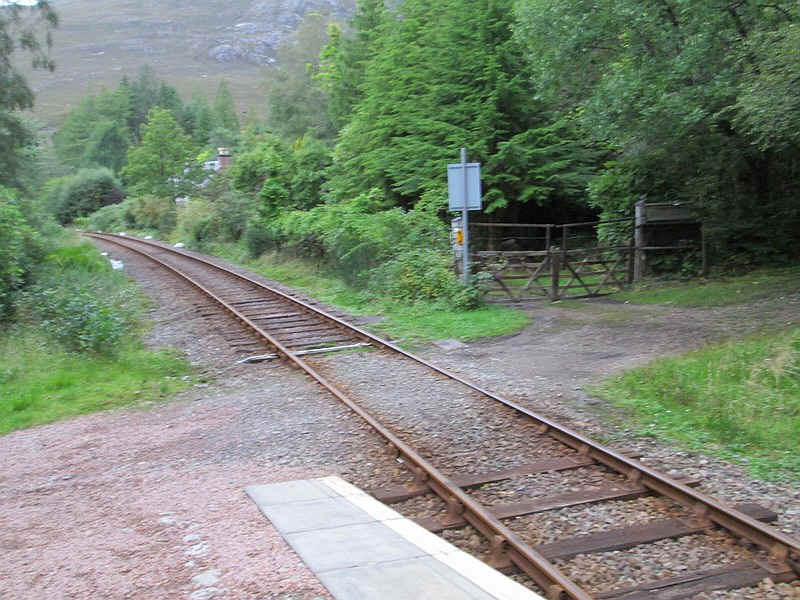 My train back to Strathcarron wasn't until 19:34 so I had rather a long wait but there's a shelter and I had a book to read so the time passed quickly. 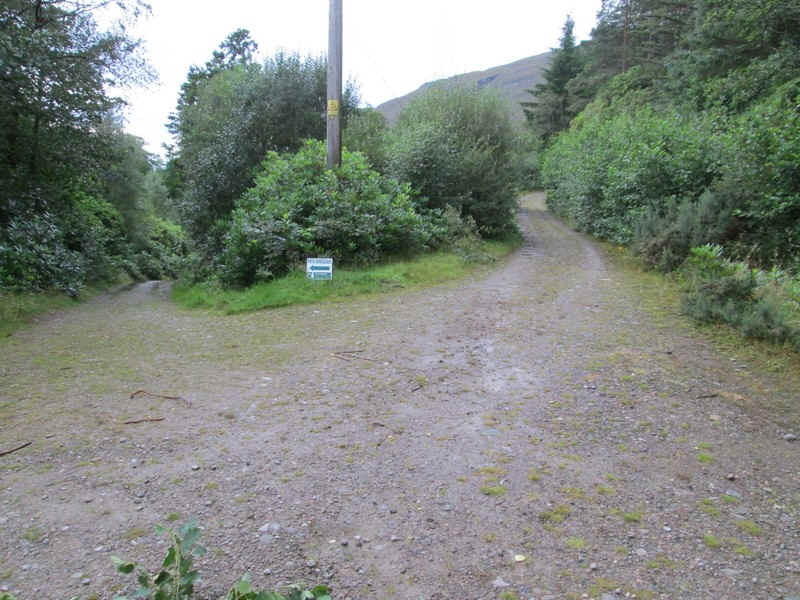 The midges then decided to become active so I went for a wal along the forest roads. 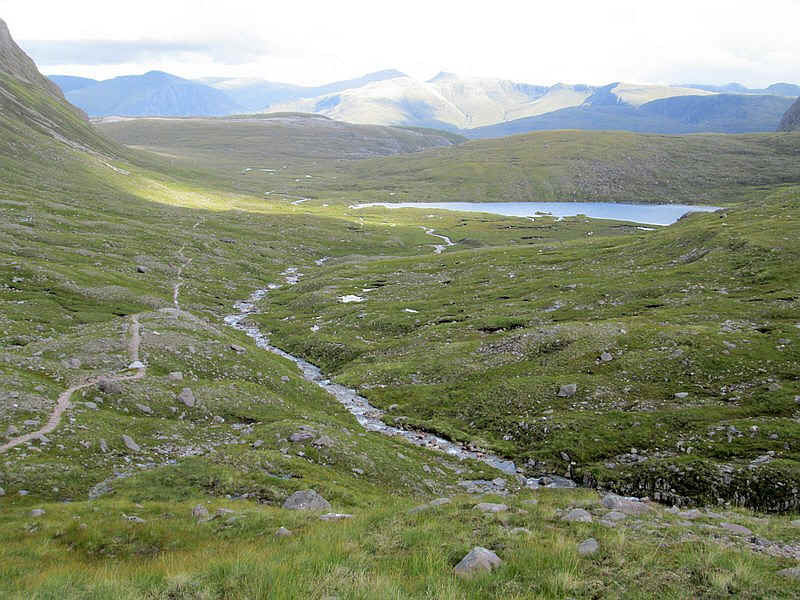 If the weather had been bad I might have been tempted to fill in the time by taking the Inverness bound train at 18:21 to Achnasheen and wait there.